Usually we cache on the morning, when we were are alert and at this time of year, when there is longer daylight. Today, though, would be different. We cached in the afternoon in ever-fading light. 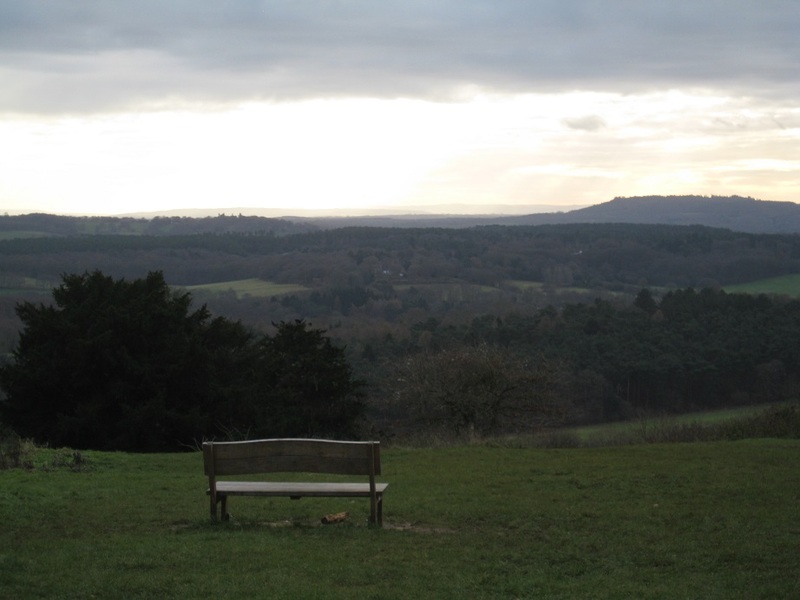 We were at Newlands Corner, on the North Downs just East of Guildford. 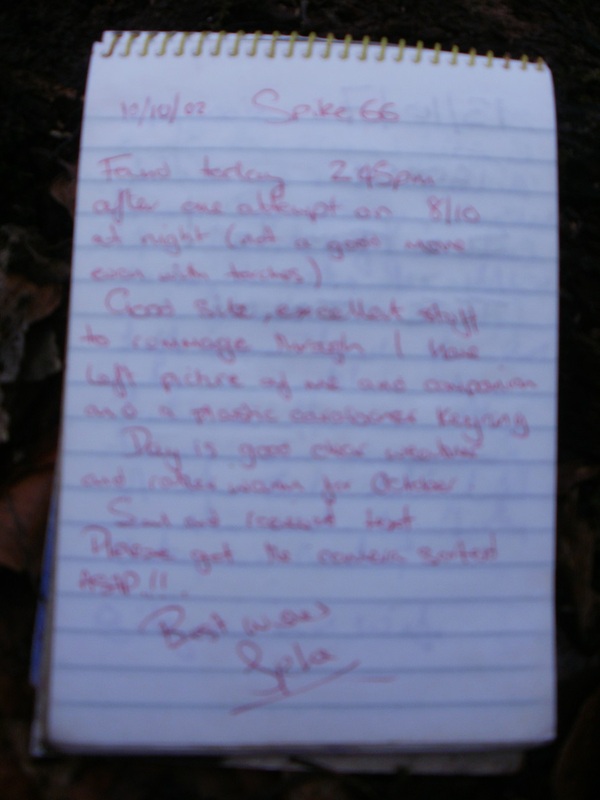 We had planned to visit the dozen or so caches in November, but the lure of a First-to-Find took precedence over the Newlands Corner caches. 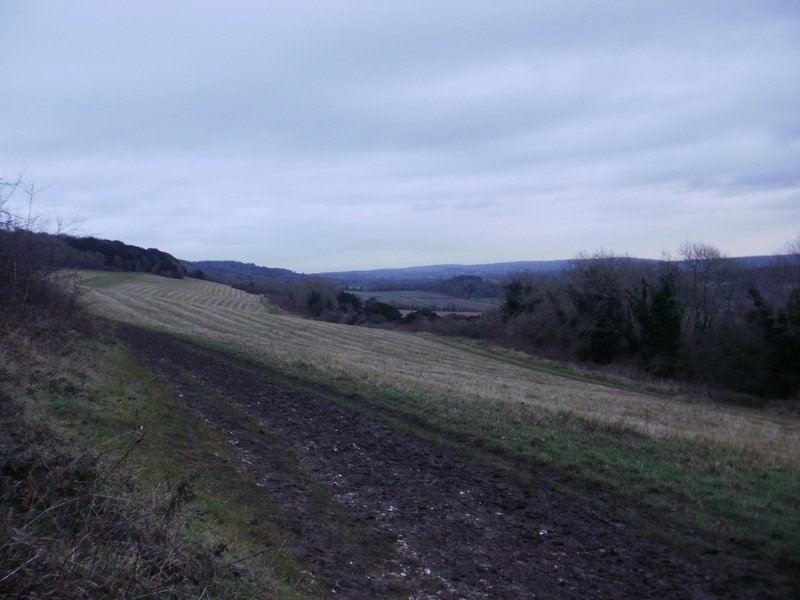 Our first target wasn’t at Newlands Corner but close to a nearby Golf Course. It was a puzzle cache entitled “Tower of Babel” and it involved converting “limayksiegyerbghaczterysjuyedi” into usable coordinates. We strode purposefully alongside one of the greens as a foursome completed the hole. Whether they wondered what we were doing, we never ascertained as we quickly took a sidepath into some woodland. Here we circled for some time, until we narrowed the GZ to two host trees. We searched one apiece, and after a few minutes the cache was ours! We parked in the spacious Newlands Corner Car park fully expecting to pay. According to the Surrey County Council website parking machines would have been during 2017, yet we saw none. We checked in the Information Centre – and yes, there was no charge to park. Fab! Close to the Information Centre was a straightforward cache which we found nestling in some bark, midway up a tree trunk. Then our luck ran out. We attempted a two stage multi needing to find a memorial seat and a numbered ‘stone’ which would yield the required Northings and Westings. What Mrs Hg137 hadn’t realised was that a third waypoint had been loaded… the middle of the car park. We spent some time looking for seats and stones in the car park before the penny dropped ! Doh! Once realisation dawned we quickly found the two objects, and created coordinates for the final cache. Since it was on route back to the car, we decided to try for another cache or two first. A yew tree provided the GZ for our next cache. This yew had splayed itself in different directions and provided a simple climbing route to the myriad of nooks of crannies 8-10 feet above the ground. Muggles passed heading the car park – had they noticed Mr Hg137 tree-climbing in dark December gloom ? The cache was not in one of those holes but one Mrs Hg137 nonchalantly found from the ground! We attempted one more cache with a hint of ‘magnetic’. 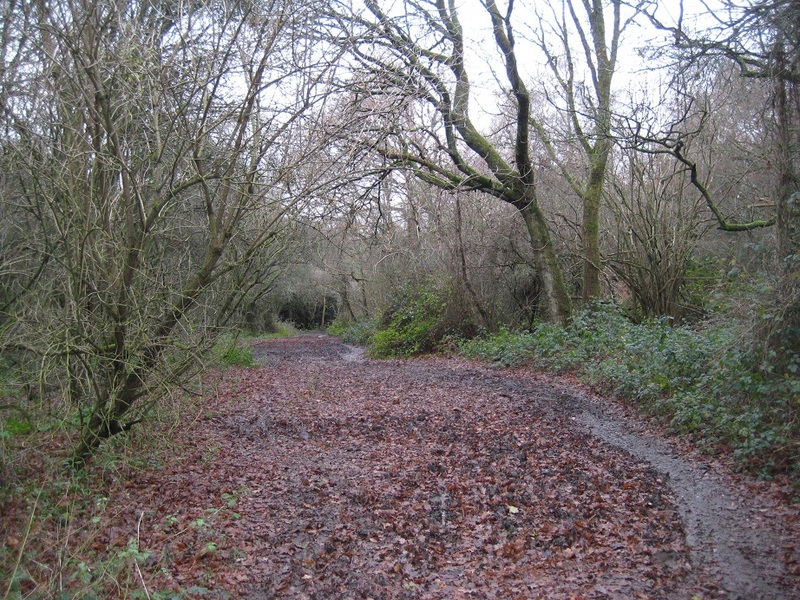 We were on the outskirts of woodland, by a muddy path leading to fields. A notice board and a gate stood as the objects to search. 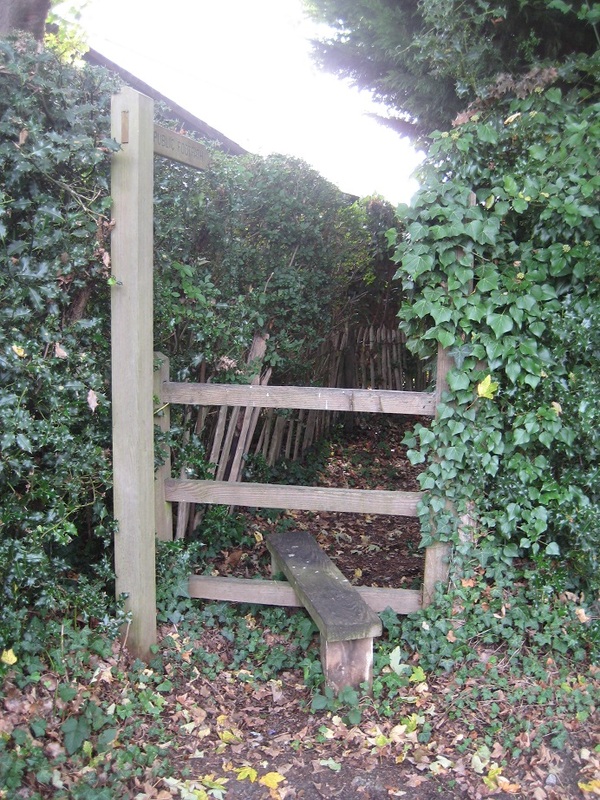 The notice board was totally wooden, but the wooden gate had metal reinforcements and hinges. We searched. To no avail. People came by the gate, we searched again. Some of the people returned as their wellington boots could not cope with the ‘mud-fest’ beyond. In the end, we gave up as the light was fading fast, and we still had the multi to find. Our walk back included the ‘mud-fest’. Really slippery mud. A couple exercising their dog nearly toppled over in front of us, but with stout walking boots on we overtook them quite quickly and had their dog as our companion for a few yards. 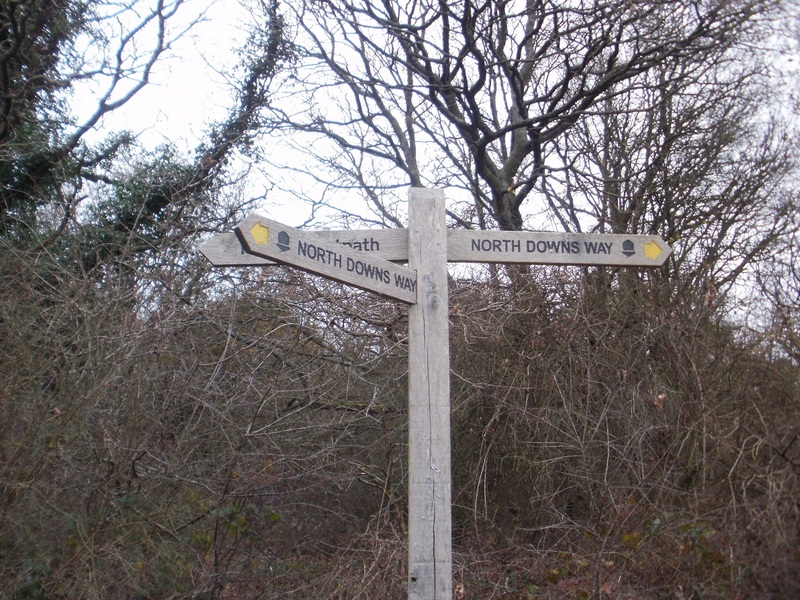 We hadn’t realised but we had been walking on the North Downs Way, which links Farnham to Canterbury. If we ever undertake to walk this 156 mile route, we must remember to walk this section in the height of Summer! The coordinates for the multi were close to the car park. With a quite detailed hint, we failed to find the cache. We assume we were in the right place, as there were several places matching the hint.. but we saw no sign of the cache. Two DNFs to finish…but reassuringly still a large of cache to collect if, (when?) we return. But why were we caching in such appalling light ? 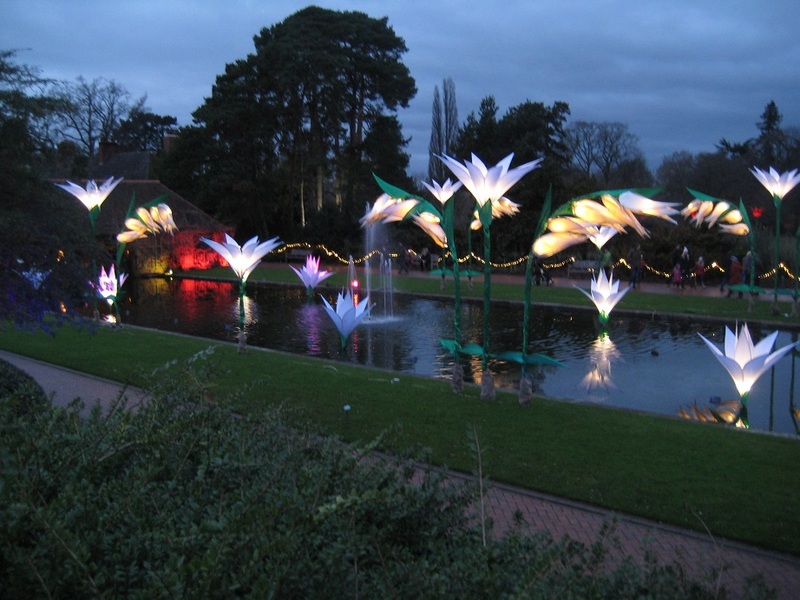 The reason was we wanted to visit the Wisley Glow trail at dusk. Wisley was a short car journey away, and when we arrived all the car parks were full. 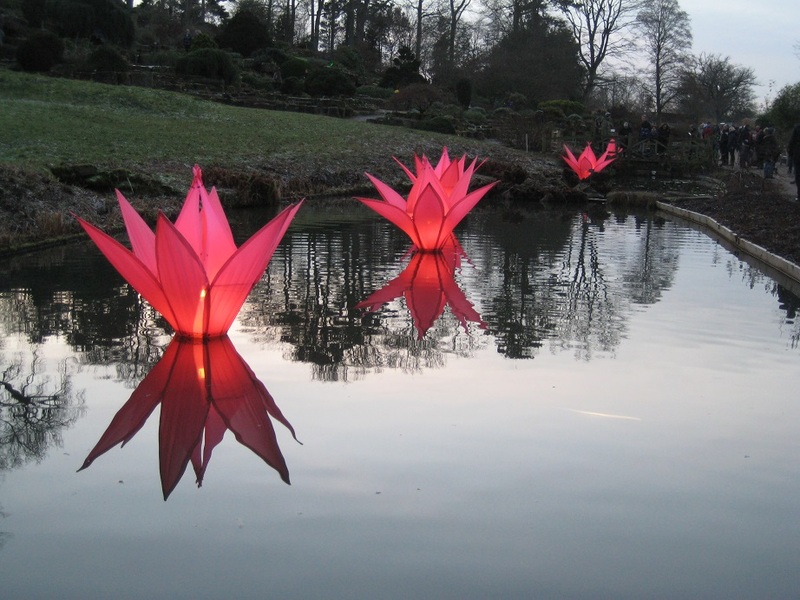 Everyone else in Southern England had had the same idea of visiting Wisley to see the illuminated trail (including Mr Hg137’s brother and sister-in-law though we never saw them!). 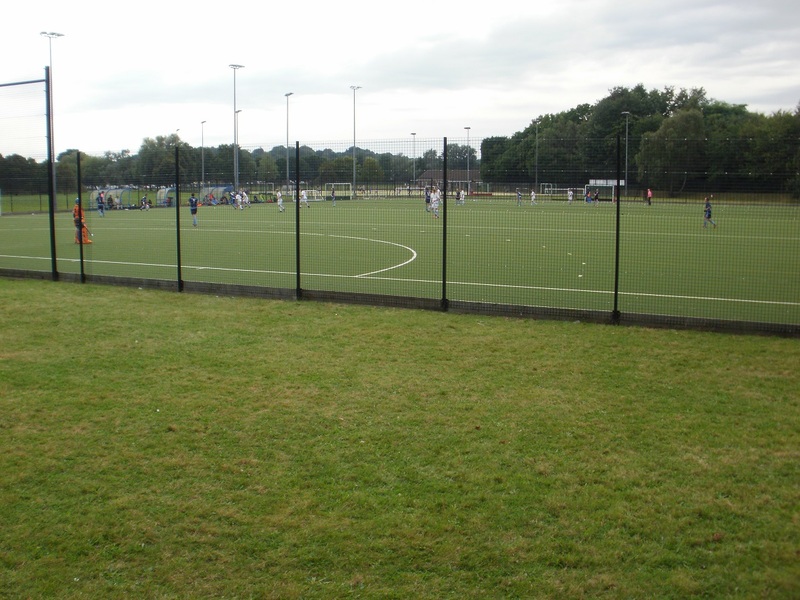 Fortunately the coach park was being opened as we arrived and we secured a prime spot within it. 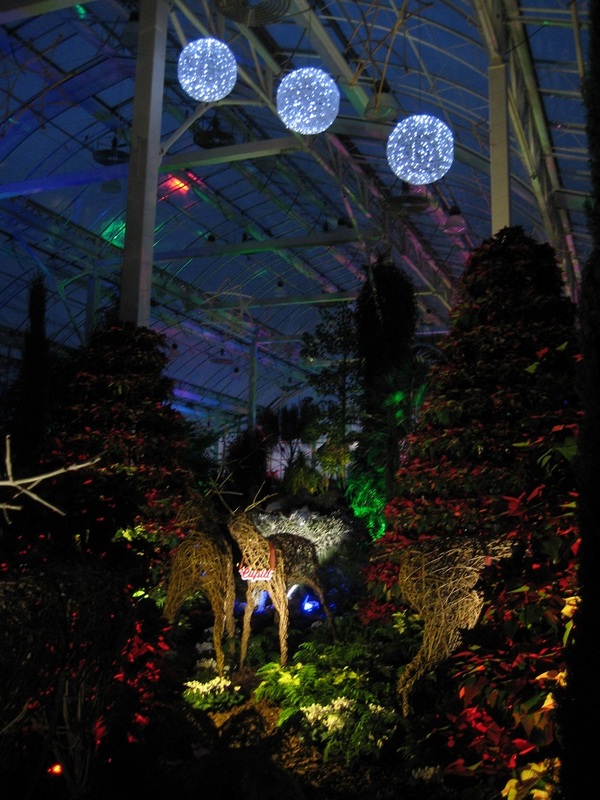 The Wisley Glow was fantastic, and these pictures don’t do it justice..Its open until early January – do visit if you can! Two days of feasting, family and festivities were at an end. We needed exercise! 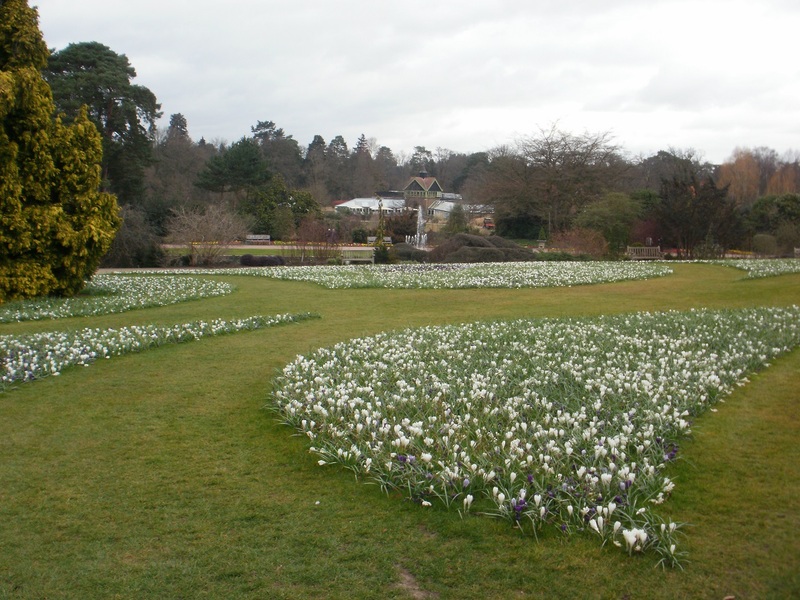 What better than a small geocaching trip followed by a walk around RHS Gardens at Wisley? 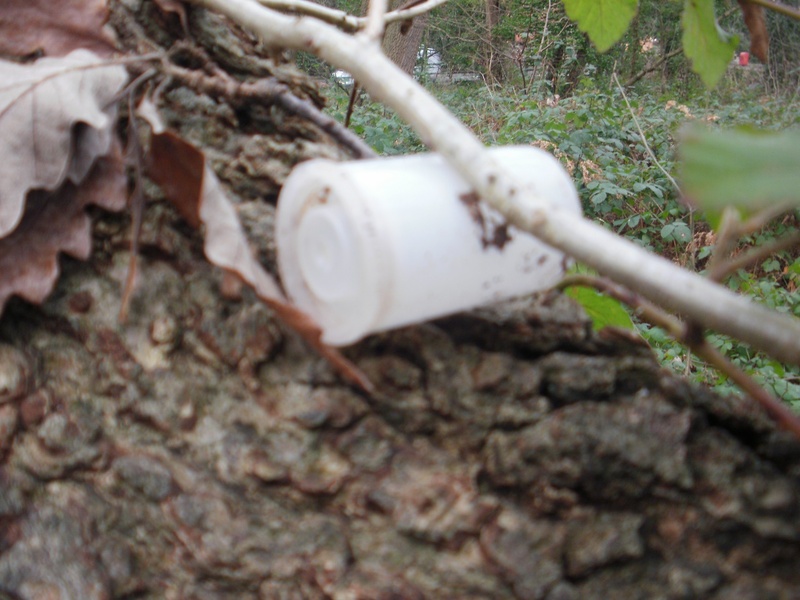 Over the years we had found all the caches near to Wisley so we ventured a little further afield to a relatively new series (October 2016) placed in West End Common. 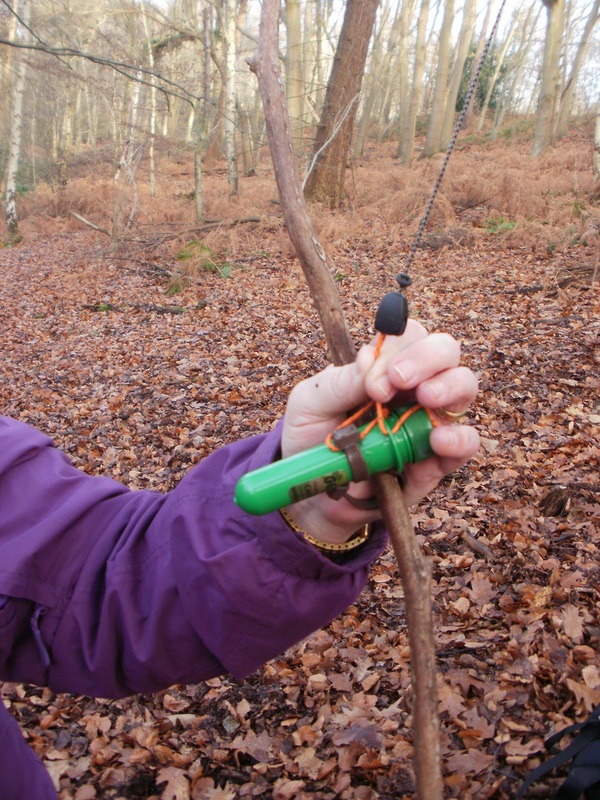 Many of the these caches had already attracted lots of favourite points so we knew it would be special! 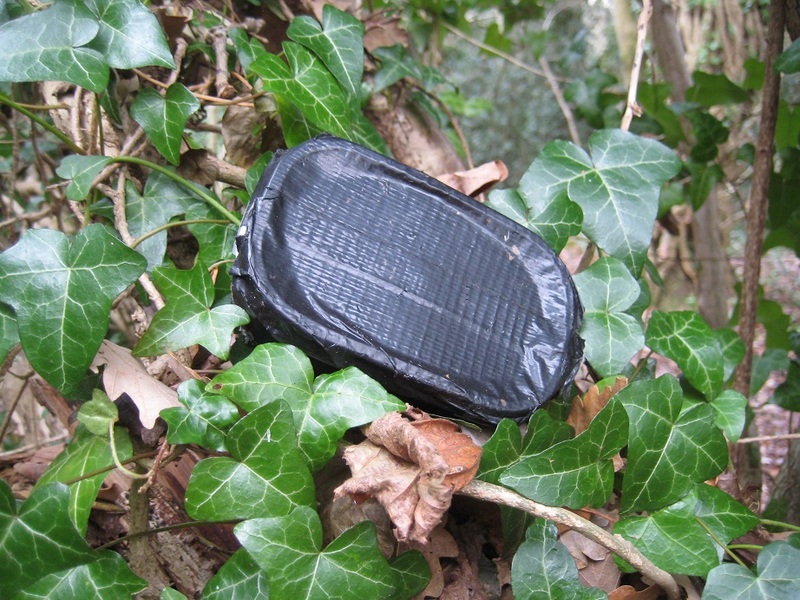 There are 10 caches in the series, and one much, much older cache, Leviathan, planted in 2001! 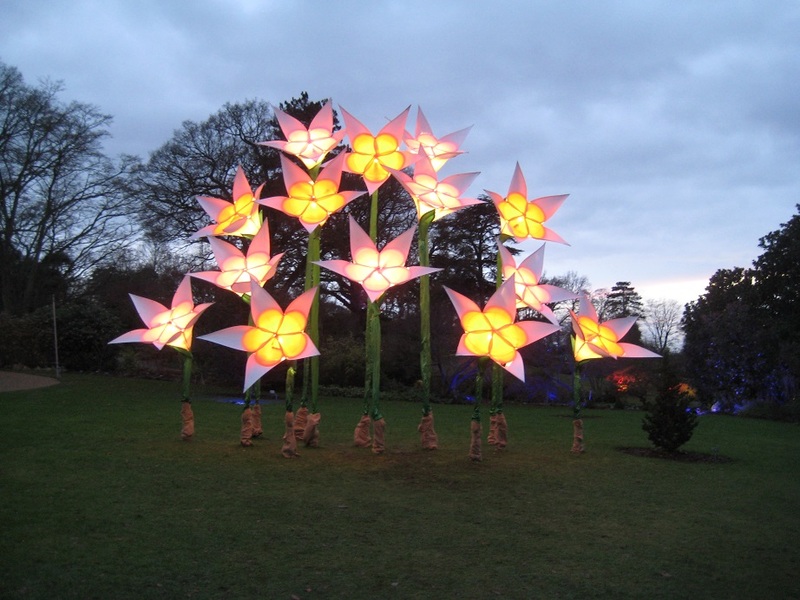 Normally we like to start caching at 930/1000 ish, but today we started late morning so we could arrive at Wisley to see the Christmas Glow light festival at dusk. Late morning though is not the time to arrive at a smallish car park, the morning dog walkers had not yet finished and the car park was full! We managed, just, to fit the geo-car in the last remaining space and set off. Cache 1 in this series, is, we believe, a tree climb. Leastways, the comments, the hints, and the difficulty/terrain rating all allude to it being a tree climb. But our GPS would not settle and bounced between 2-3 likely (and unlikely) candidates. We could not see a cache, and in most cases how to even get started on a climb. So we left this cache unattempted. Cache 2 required a ‘nearby tool’. What could this mean ? Our GPS again took us to three different locations. The first a multi-trunk tree… nothing there. Then a pair of silver birches…nothing there. Then another larger tree… not much happening there. Our investigations had been noticed by a passer-by. “Are you looking for a lens cap ?” . They had clearly found one on the path 20 meters away. “No, thanks”. We replied. We paused while they walked away. We re-read the logs, and discovered someone mentioned ‘height’. We had been concentrating on looking low, and suddenly we looked up…straight at the cache. Twenty feet in the air! 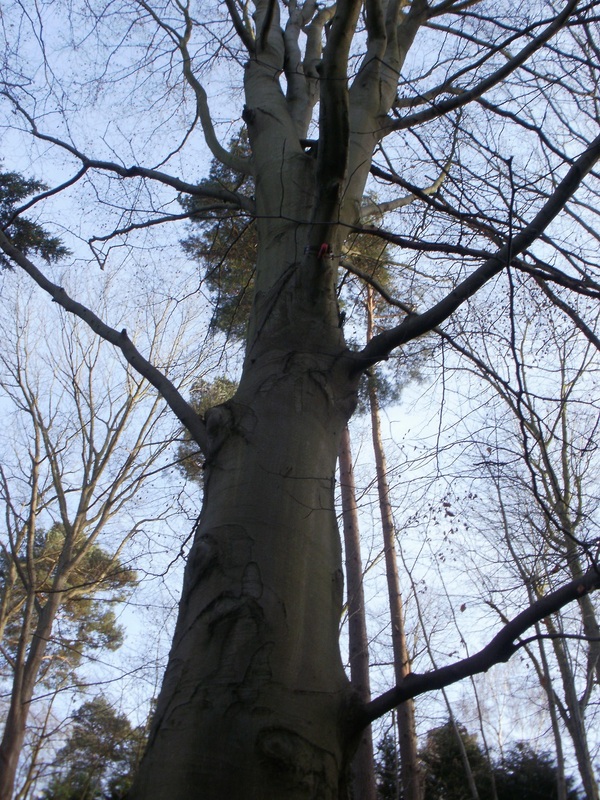 The cache was attached to a retractable dog lead, the dog lead itself firmly fixed to the tree-trunk. We needed to find a long (sorry, very long,15 foot) branch and attach it to the dog-lead handle and pull. Waving a 15 foot branch in the air, and trying to hook the end through a hole the size of a wrist isn’t easy. But after several attempts we managed it, and pulled the cache to ground. Here we held onto it tightly as we signed the log, and then let go of the branch … watching the cache rise higher and higher. A fun, if tiring, cache! Log signed – ready to replace! Safely back – 20 feet higher! We followed the paths to cache 3. We assumed that we were following paths, as the Autumn leaves were still thick on the ground, and it was sometimes tricky to know whether we were on paths or grass. Cache 3 was much, much easier to find than cache 2. Hidden in a stump by a yew tree. 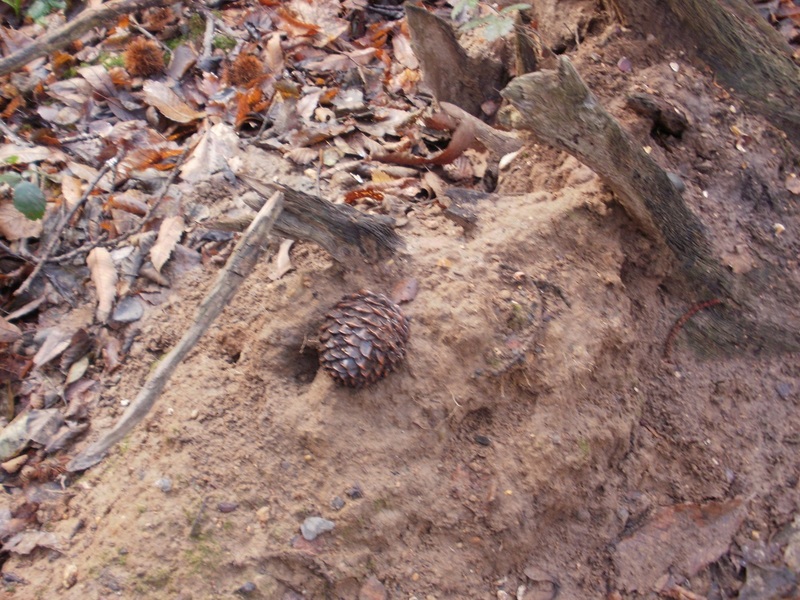 An easy find, yet it still took us two attempts to locate the well concealed pine cone. We were near a BMX track, and sat on one of the ramps and ate lunch. Three caches attempted and each had taken a fair chunk of time. We reviewed the number of caches and time left and decided to shorten our caching trip at about halfway. Even at 1 o’clock the light levels were not good, so with even poorer light, we wouldn’t stand a chance! Our route to cache 4 can best be described as problematic. Mr HG137 thought the footpath would circle around to the cache, even though the GPS was in the opposite direction. The true path, involved walking a fair way back to cache 2, which for some reason we ignored. Instead we followed the BMX track, then a muddy half track, jumping across a stream, avoiding more mud, climbimg a steepish slope, and arriving somehow at GZ. Well not quite at GZ. A trcky bridge to reach cache 4! GZ was the other side of a slippery, branch bridge! We both tentatively crossed as we needed 2 sets of hand at the cache… a floater! We’ve never done of these successfully, and today we wanted to change that! Armed with our 2 litres of water Mrs HG137 poured it into the top of the cache. Mr HG137’s hand was firmly wedged at the bottom preventing liquid egress. Slowly, slowly the cache rose. A futile grab by Mrs HG137, and more water was needed. Second time lucky! We would have liked to have taken pictures of our slightly comical manoeuvres but, with all hands busy…even a selfie stick wouldn’t have helped! 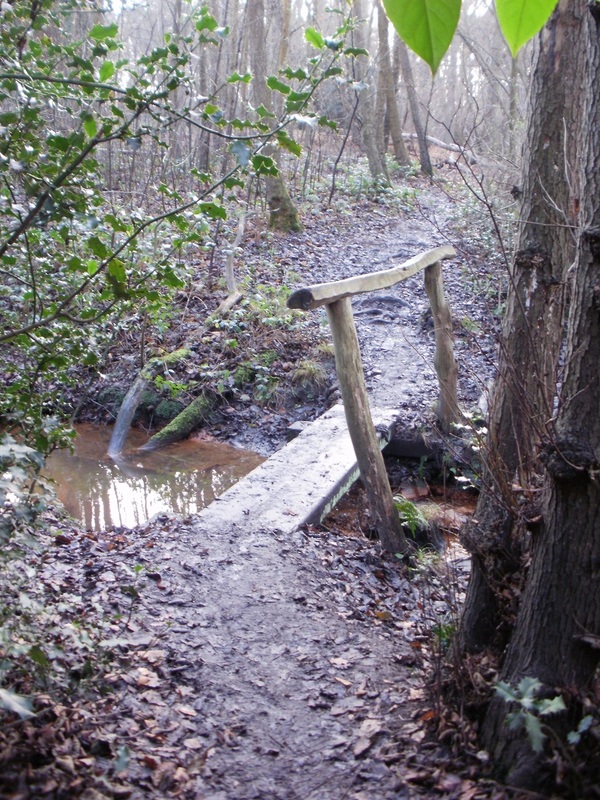 Log signed, cache replaced and then the slippery bridge to cross. Phew! 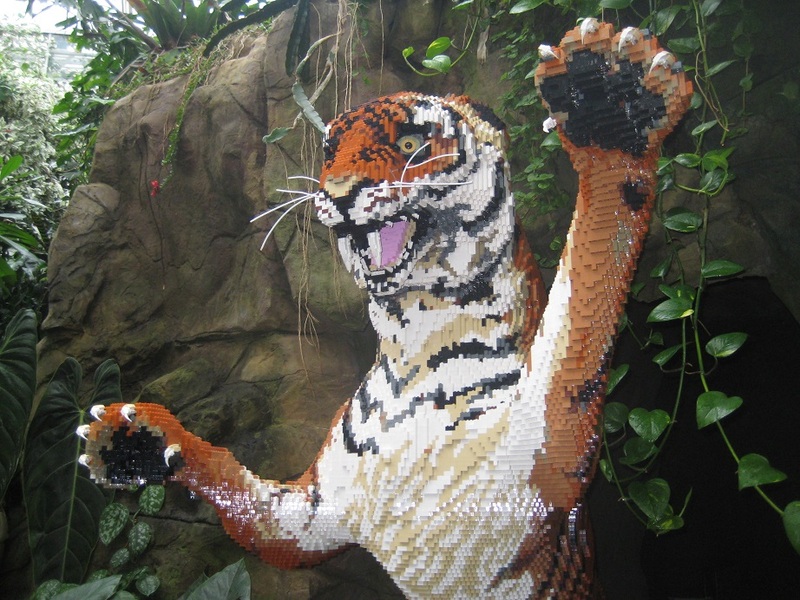 High fives all round! 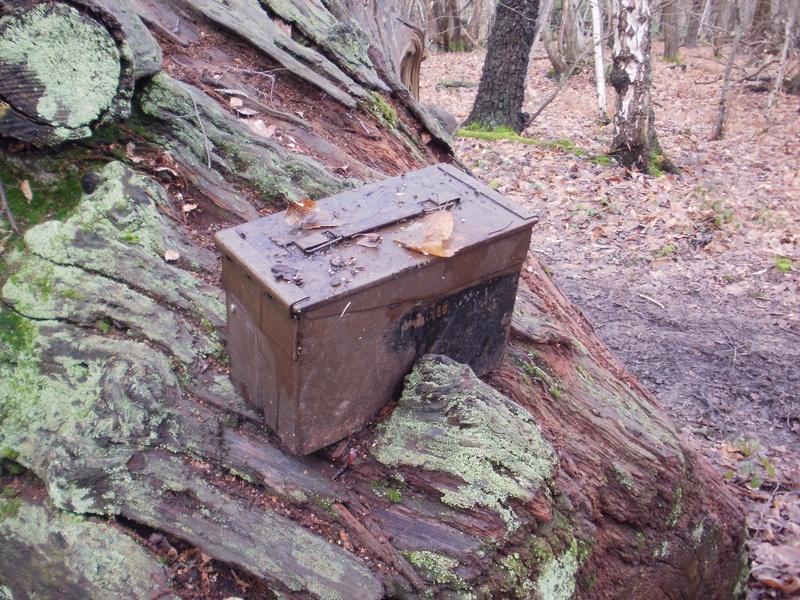 Our intention was to undertake two more caches, number 5 in the West End Series, and the old Leviathan cache. When we arrived at cache 5 we decided against retrieval. It required climbing/walking across some branches half-submerged in the River Mole! Not for us! 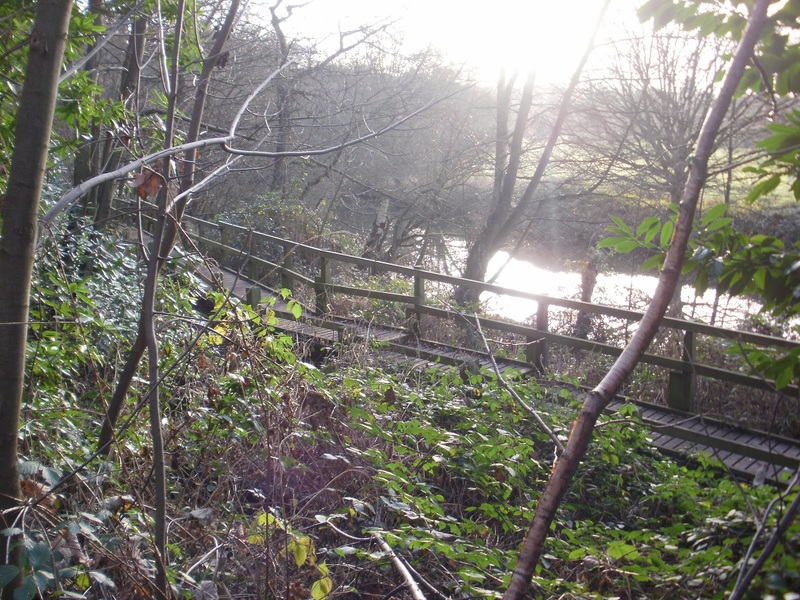 The footpath continued along the river. Sometimes dry, other times so wet a boardwalk had been erected. It was near to one of these boardwalks we saw a middle-aged man slip right over as he descended from the boards onto the muddy path. How we remained clean as we hauled him up we will never know! Leviathan by name and by nature. 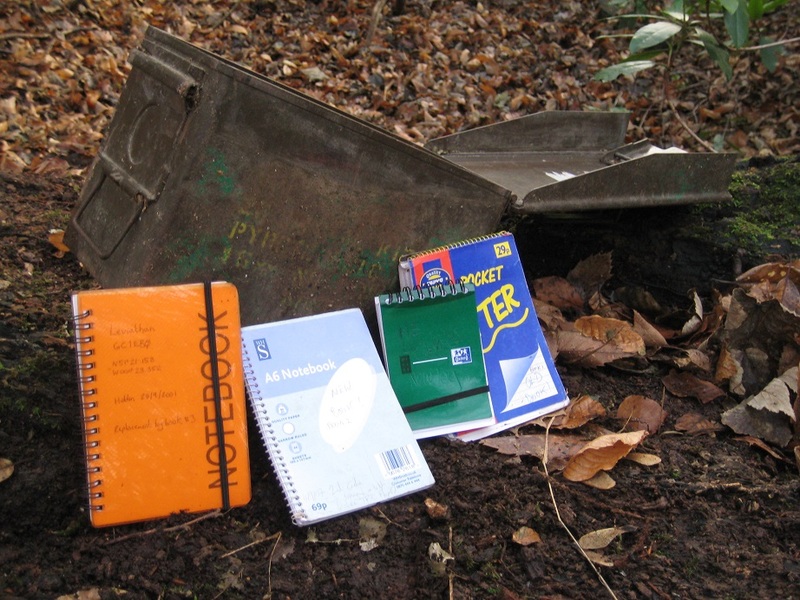 It was hidden under an immense tree trunk and was an immense size.. an ammo can! We don’t see too many of these and it was great to see such fabulous old container. Inside were ALL the logs going back to 2001. In those days people wrote about their exploits, the weather, in the log book. A far cry from today’s “sign it, date it”. 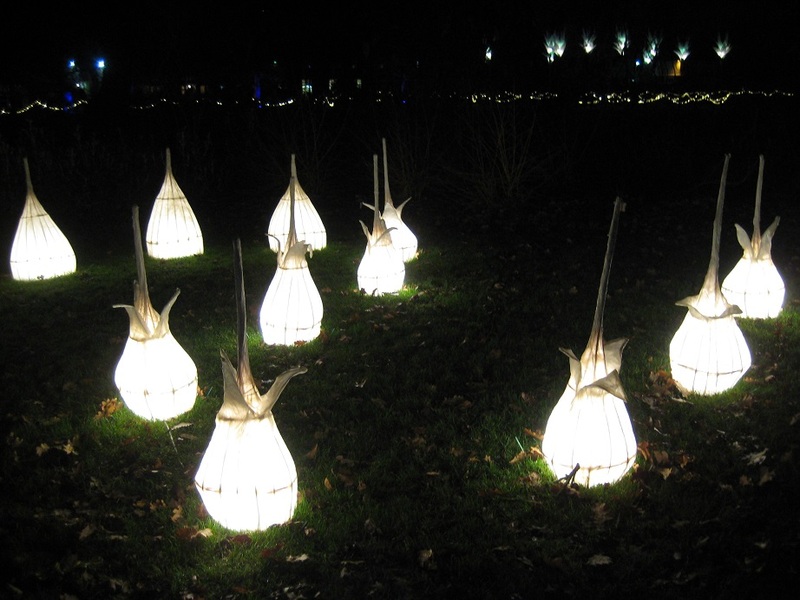 The light levels were fading fast and our decision to abandon our caching trip proved correct, as we arrived at Wisley at dusk, seemingly with thousands of others, to marvel at Christmas Glow trail around the grounds. A great end to a great day’s caching. September 24: HG137 undertake part of the HG Ring! 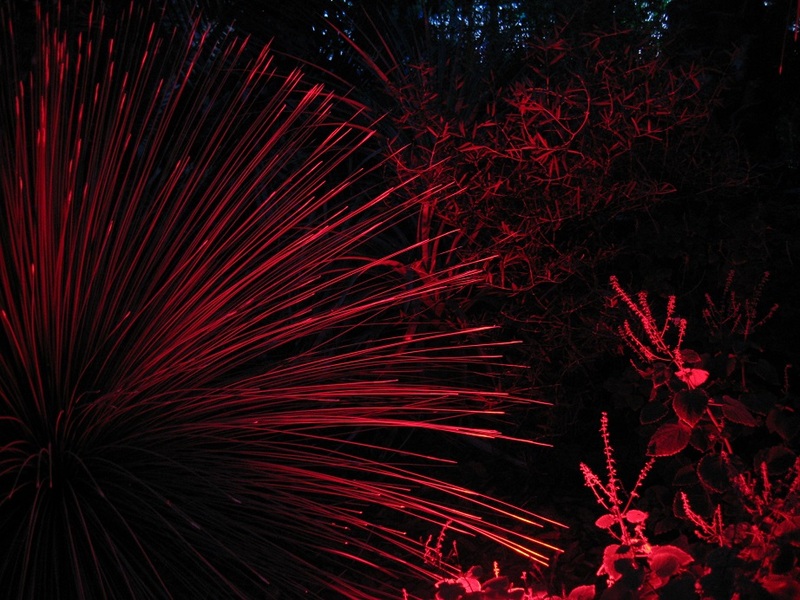 September was drawing on and our caching had been light. 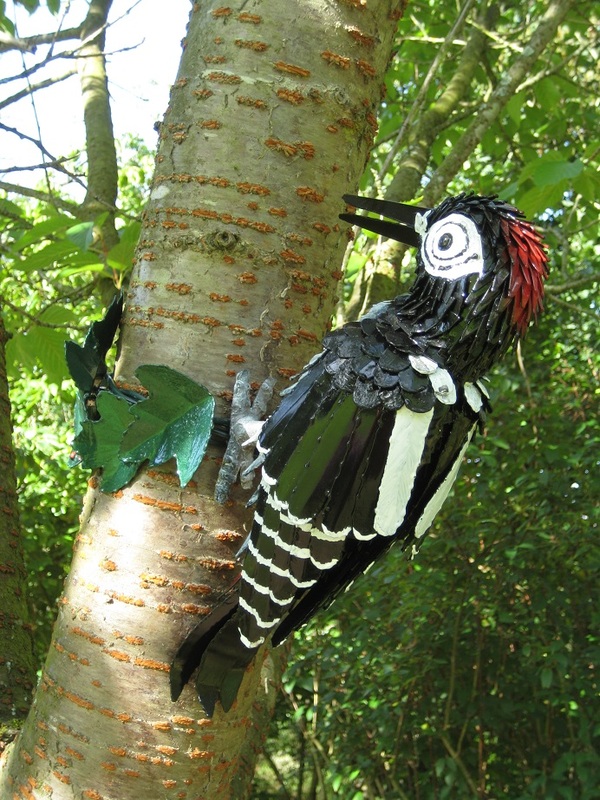 We had also not visited RHS Wisley recently and its annual 5-week sculpture trail was coming to an end! We needed to fit them all in ! 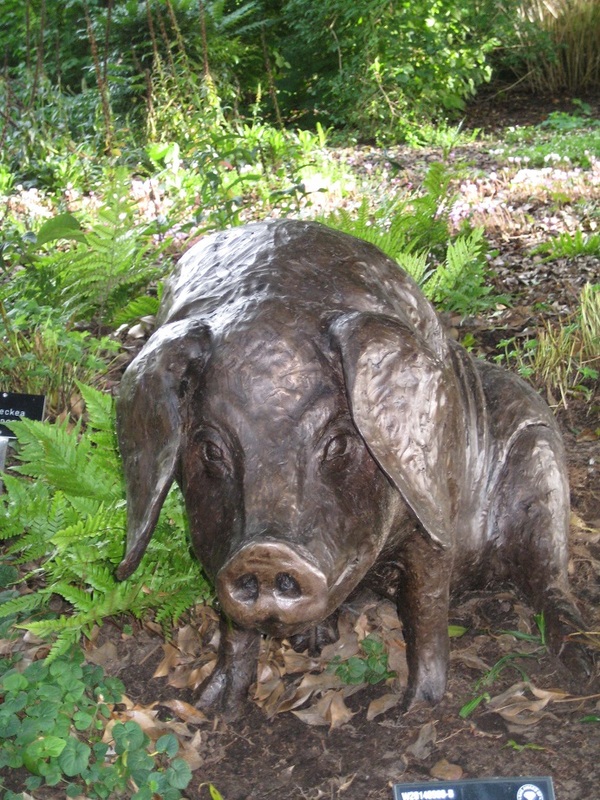 We arrived at Wisley and looked at the 60+ sculptures, many were very sinuous or etheral and perhaps aimed at the corporate market. 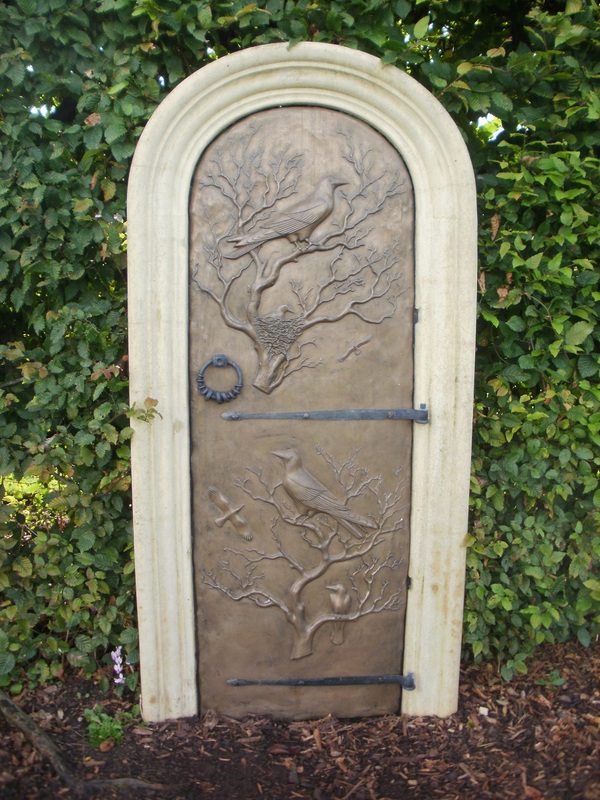 However this year there seemed to be more ‘garden art’ and these three provided us with the most pleasure : a door to nowhere, a pig and a woodpecker! The flowers at Wisley were still holding onto their summer resplendency but with a cache trail to undertake we didn’t look at every flower or vegetable! We had cached all the trails near to Wisley, so we drove to an area North West of Woking and undertook part of the HG Ring series. 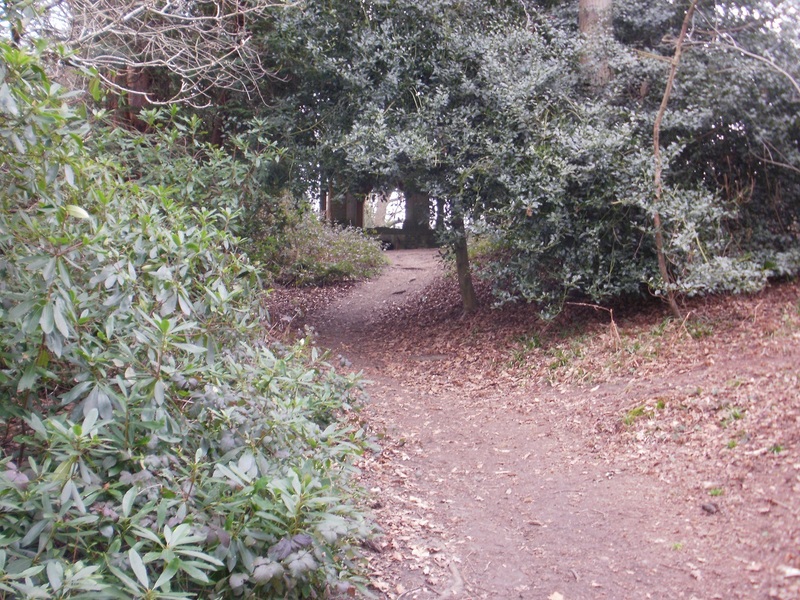 The cache owners, Woking Wonders, named the HG series after Horsell Common and Goldsworth Park which the trail linked. HG, in the context of Woking, could also have meant HG Wells who lived there, as well as his novel ‘The War of the Worlds’ which he set there too. Of course to us, who cache as HG137, the cache series had an entirely different meaning! The HG Ring consists of 20 caches in a figure of 8, we undertook 12 caches on the Western loop, and deliberately left a couple of connecter caches to make the Eastern half more cache-heavy for a future visit. We started at Goldsworth Park at cache 5A. Nearby two games of hockey were being played, and spectators, if they looked behind, would have seen us, peering at every tree we could find. Although there was only a couple of trees meeting the exact hint, the preceding cacher had hidden the cache extremely well, and we only found it after a 15 minute search. Onto cache 6. Another long search. Several good candidate trees, but not much else. We searched long and hard. We were about to give up when two events happened simultaneously. Mrs HG137 noticed the tree bark was much, much smoother in one area and we were accosted by a muggle. “What are you looking for?”. We explained. Fortunately as we were explaining, Mrs HG137’s eyes were drawn back to the smooth bark, and there hanging was the tiny cache. We showed it to our muggle acquaintance, rehung it, and moved on. Two very long searches. 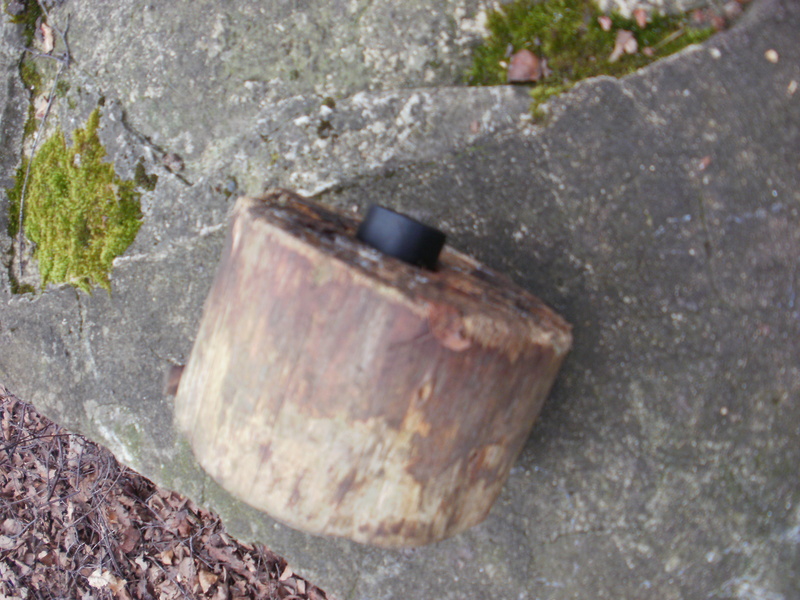 Our next cache was almost as long, but here we managed to find the appropriate mossy log after only 5 minutes. We had left Goldsworth Park and for the rest of the walk barely saw anyone else on our journey. A few people washing cars, and children playing, but no-one to interrupt our (sometimes inept) searching. We prayed for a quick find at our next location, but here too it took us ages. In fairness, tree cover caused the GPS to wobble, but 4 caches down and every one we had spent far too long at each location. Many of the cache containers were film containers and the next few were easily found (thank goodness!) 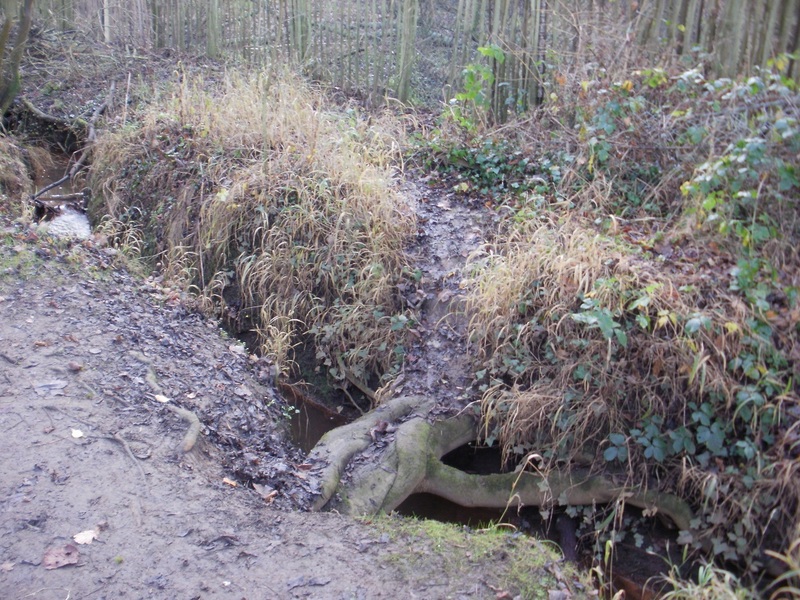 near stiles, under posts, in tree roots. Is there a cache here? 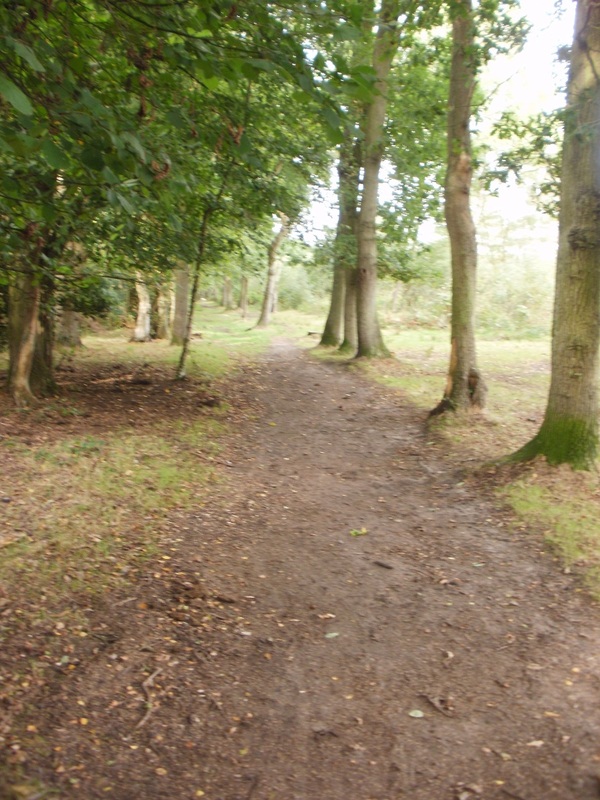 The route had taken us from a recreational ground, through woodland to an small open field. Here, as we walked along one edge of the field, a kestrel hovered on the far side. 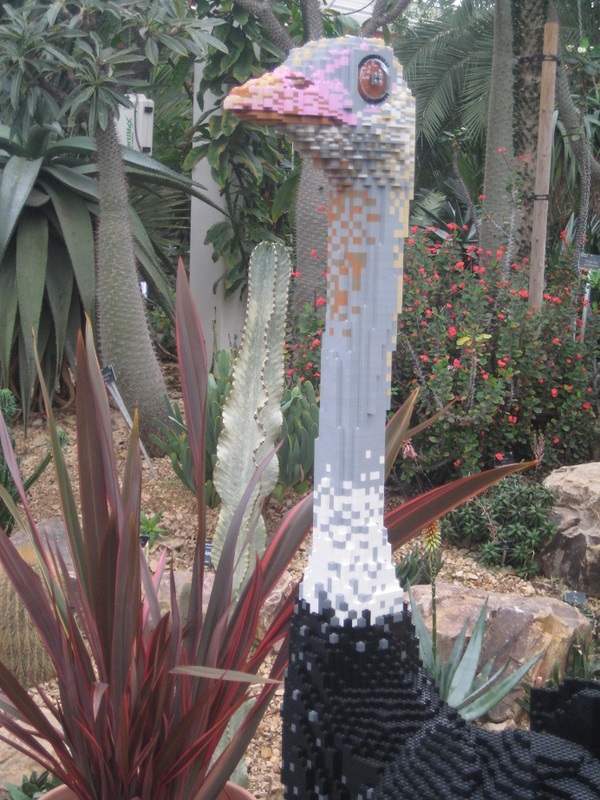 We marvelled at its ability to remain in flight with so little effort. We arrived at a road, and no obvious footpath to follow. Left ? Right ? We guessed wrong! 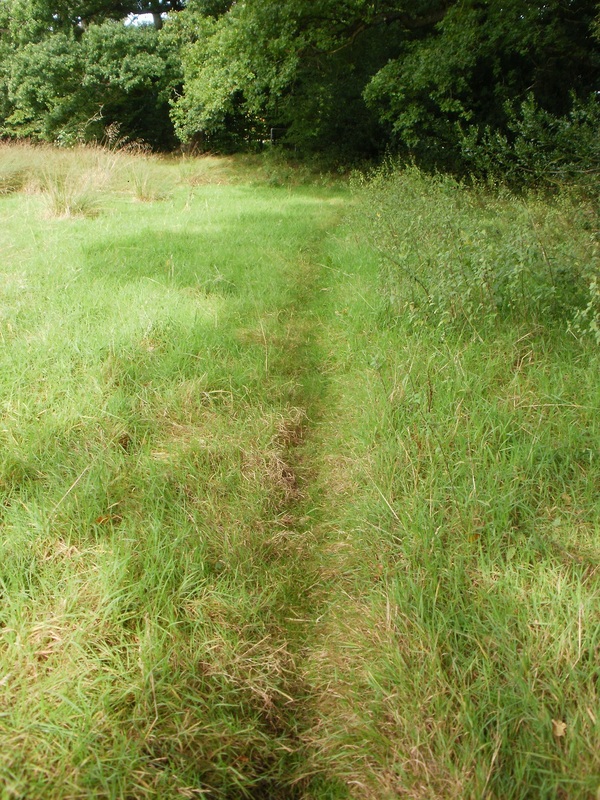 Then after consulting our OS Map, we corrected ourselves and walked through the worst footpath of the day. Stinging nettles and thistles snapped at our ankles and every pace we took was accompanied by a wince and a groan. Two farmers watched our movements, each driving a tractor or JCB. They had flattened 2 electric fences, and drove off as we approached. 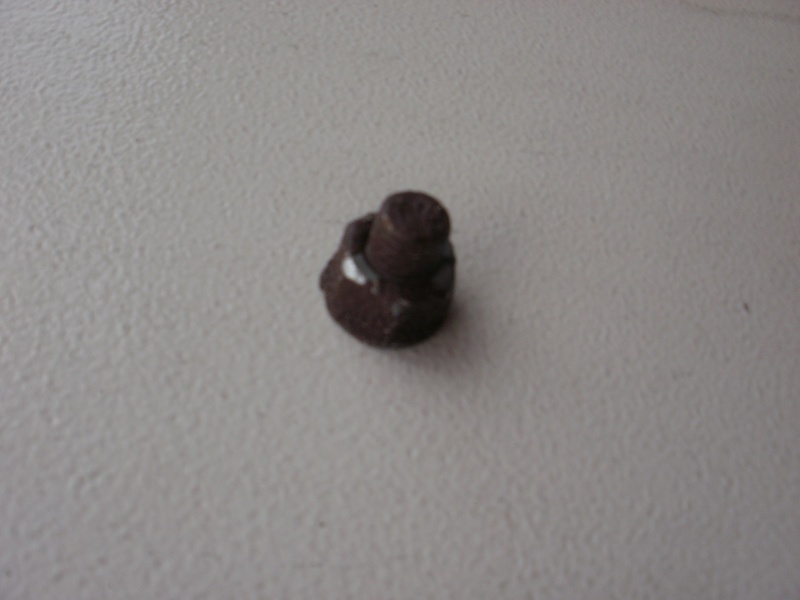 This was useful as we had a cache to find – this time hidden under a bridge. 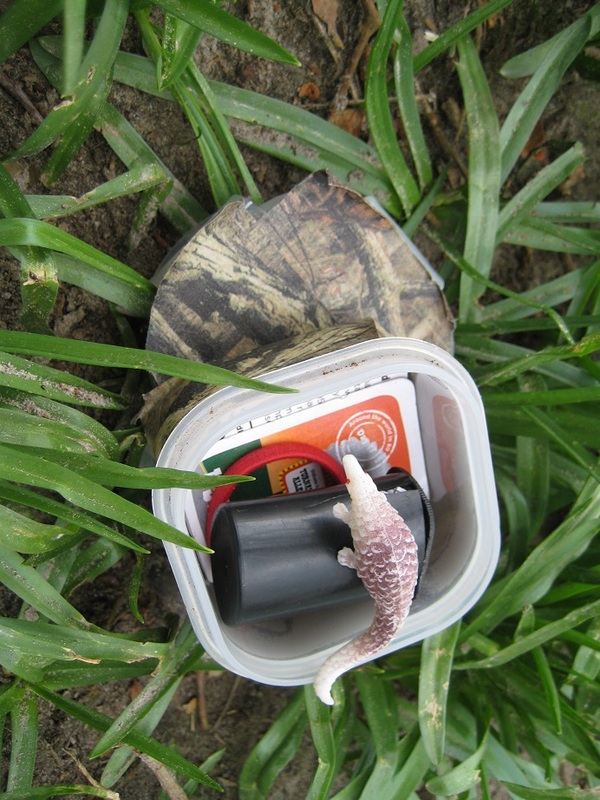 Not only did we find the cache, but 2 trackables too. (A beautiful geocoin fish, and business card to the 2018 Yorkshire Mega). 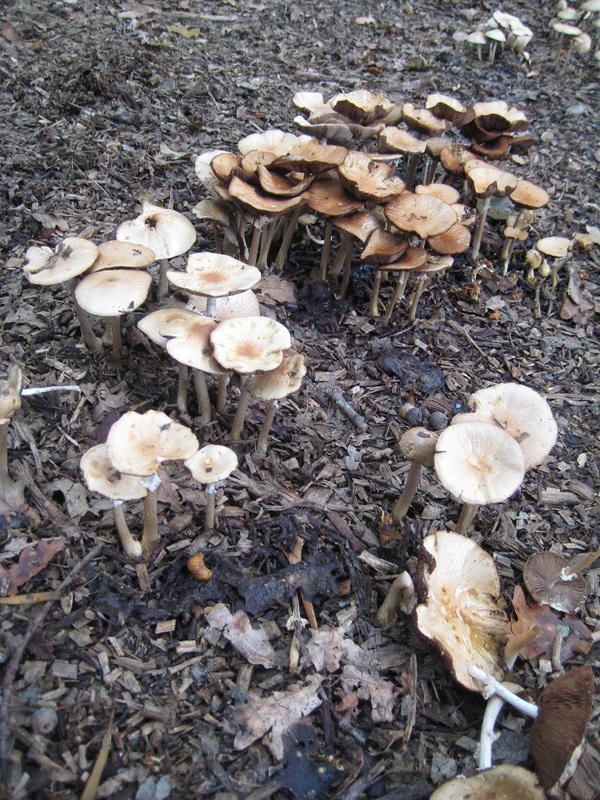 There’s not mush room on this path! We were turning for home, and a bit more tricky navigation, first through a farmyard, and second through woodland. 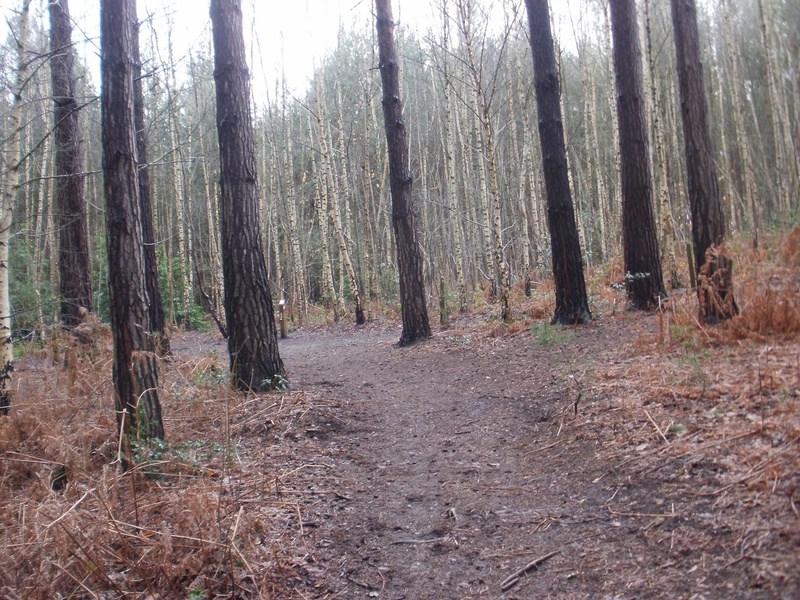 We were not totally sure we followed the best (legal) route through Horsell Common, but we arrived at, and found each cache in turn. 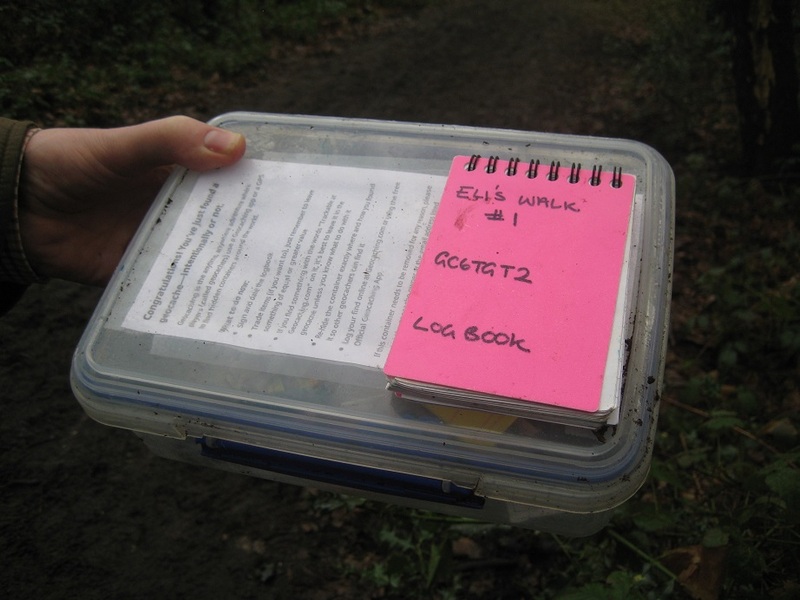 Many cache owners place caches at significant changes of direction – it was unclear to us why this hadn’t been done on this route. Three caches from the end was an unexpected location. 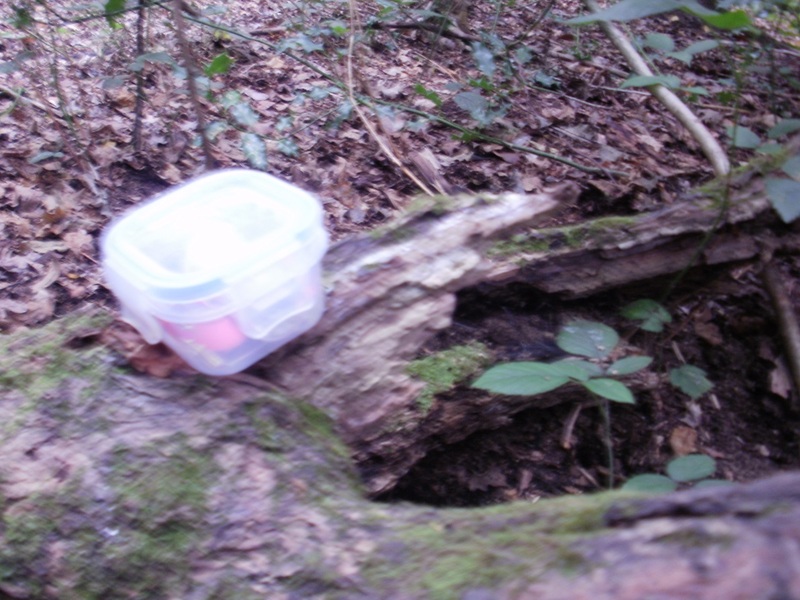 The cache was hidden in a small tree, right in the middle of the path. 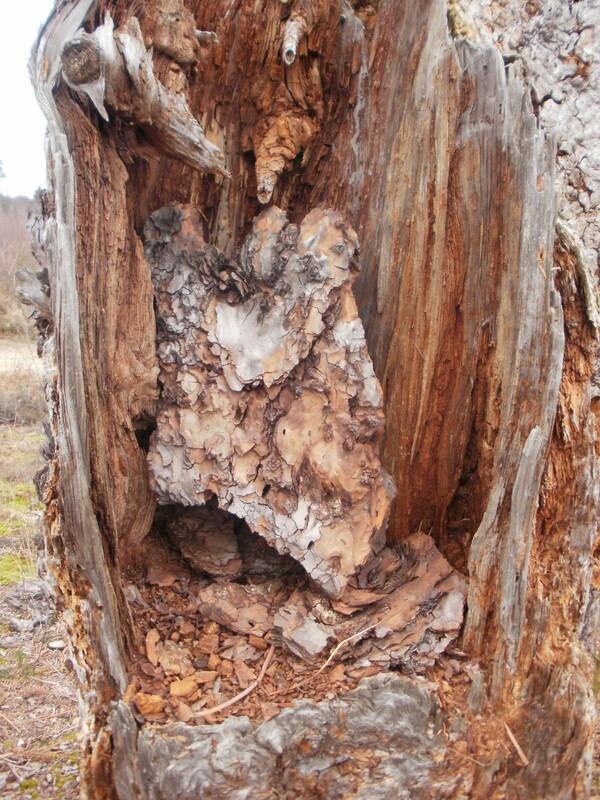 We were so astounded by this, our initial search had been at the larger tree at the side of the path! How this cache has remained in place without being muggled, is a testament to the good-folk of Woking no doubt. A couple more road crossings, and we returned back into Goldsworth Park. Yet more games of hockey were being played. 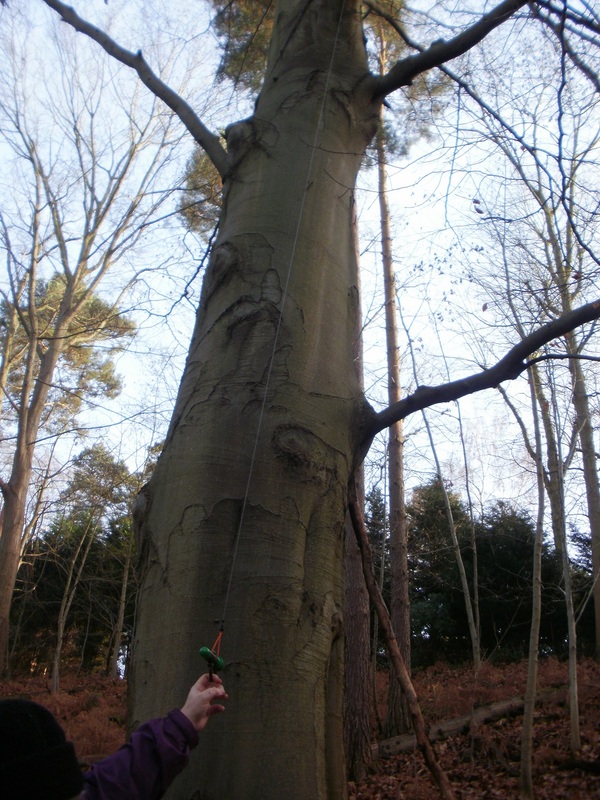 Fortunately our last cache was a quick find (reaching 6 foot up to a bole in a tree) and our route was complete. After a slow start we found all 12 caches we attempted ! We don’t often go caching on Thursday, but it was Maundy Thursday and neither of us were working. 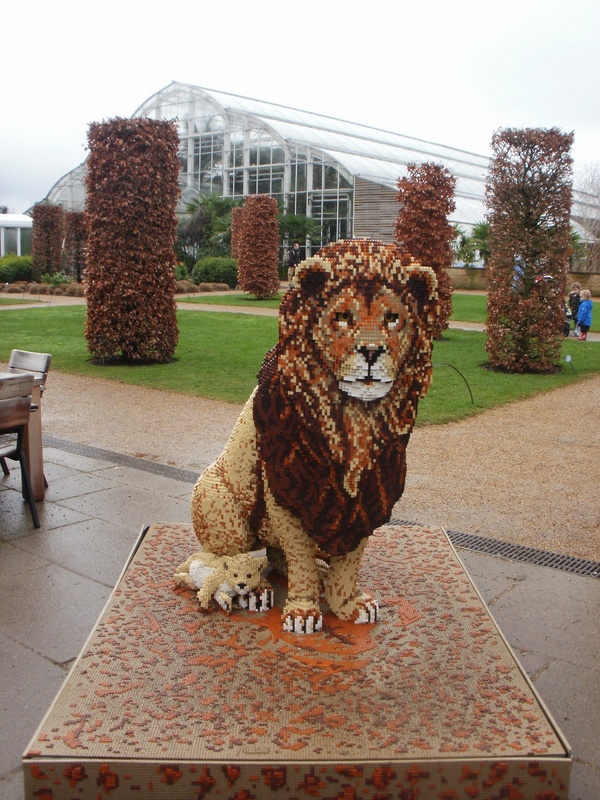 The weather promised a reasonable morning with rain later so we planned a double activity morning of caching and a trip to RHS Wisley. 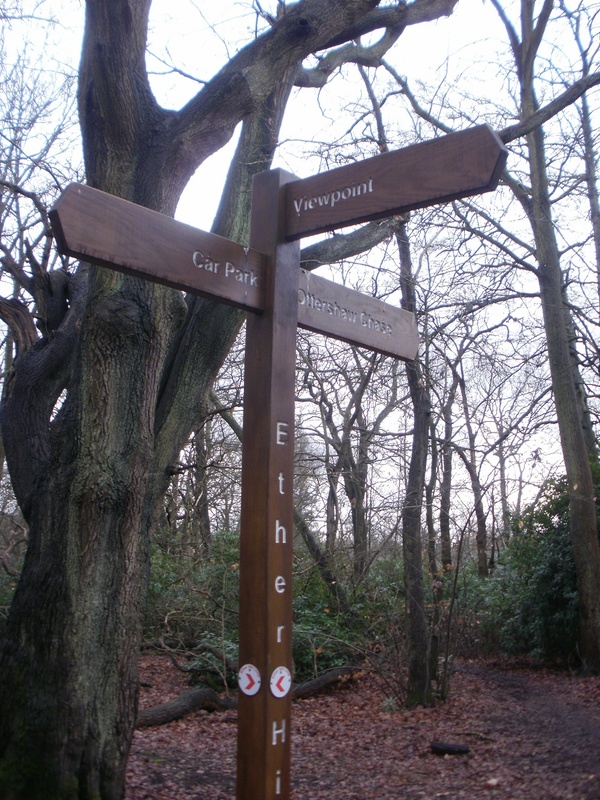 We had cached near to Wisley in the past, but there was one series of 10 caches we had not attempted – the Ockham Common Series. 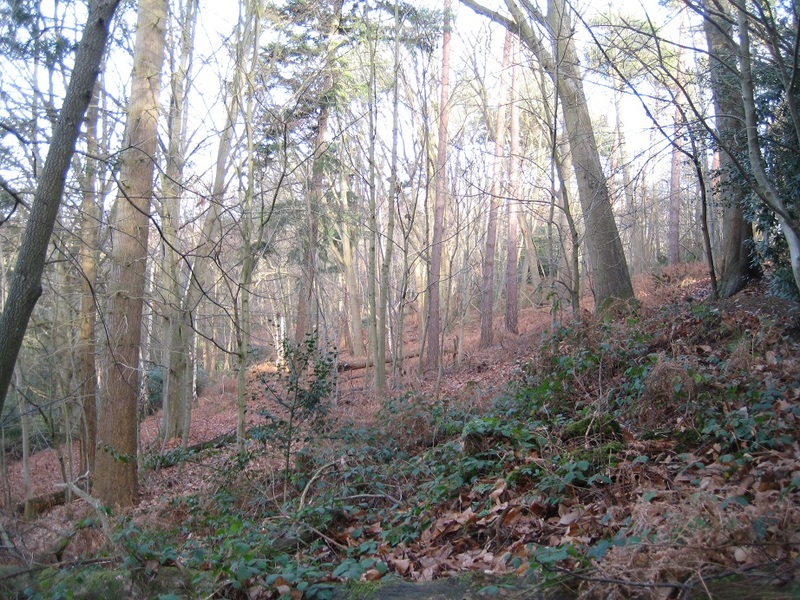 (We had found Ockham Common 1 previously, but not the other 9). 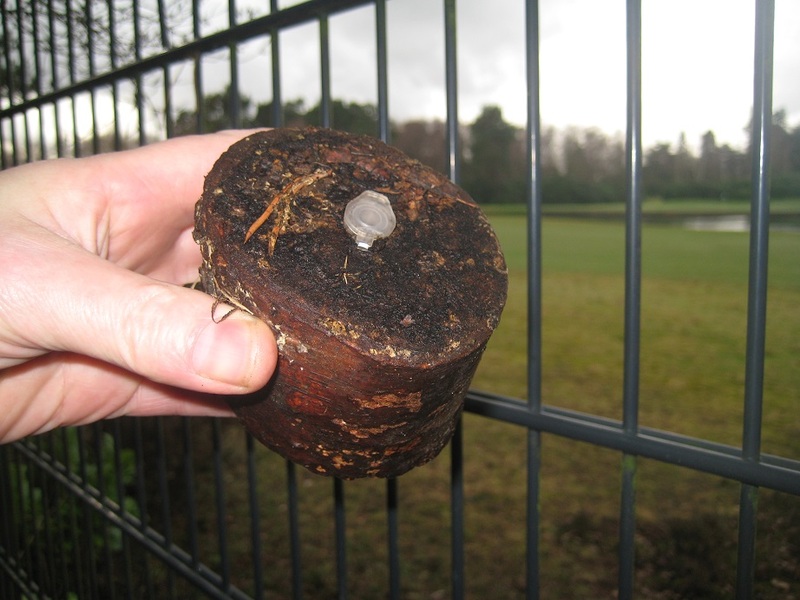 There was also another cache called “Chestnut” and a multi-part cache leading to a Trackable Hotel. We parked near the multi to establish the co-ordinates of where the final cache would be hidden. We had struggled to find the first part of the multi before, and with the hint “Magnetic” we knew it was attached to one of the plethora of metal structures at GZ. We gave ourselves 5 minutes to have another look, and this time, armed with the experience that finding over 1300 caches brings, we found the elusive first part. 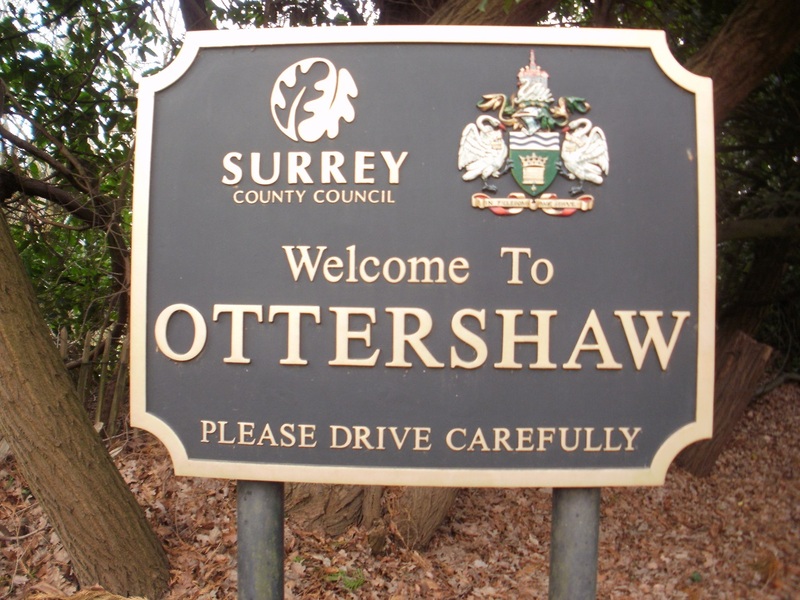 The co-ordinates for the final gave us cause for concern… they pointed to the major M25/A3 roundabout, some half-a-mile away! Something to think about for later, maybe! Onto the Ockham Common series. 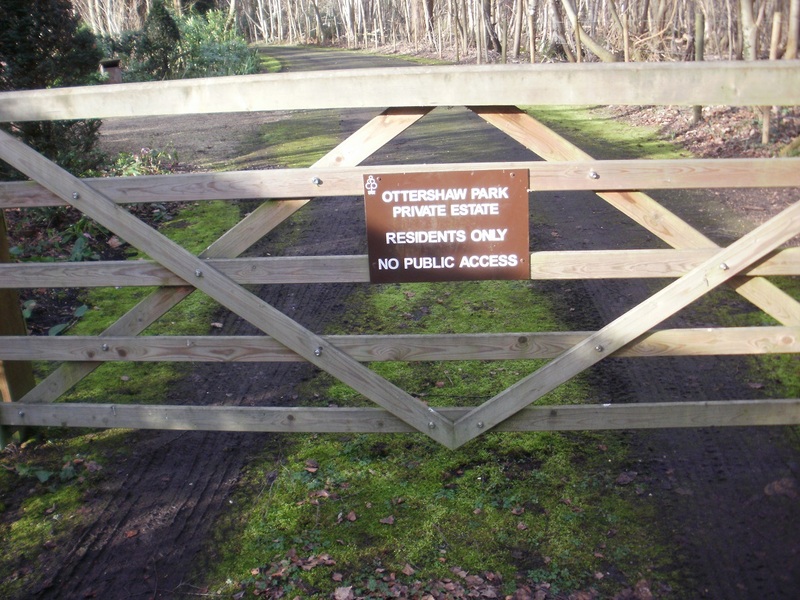 Because we had already found Ockham Common 1, it was a fair trek to Ockham Common 2. It was pleasant walk through slightly sandy heathland. Lots of trees, and many a footpath crossed our ‘direct’ route so we had to wisely chose a footpath at each intersection. 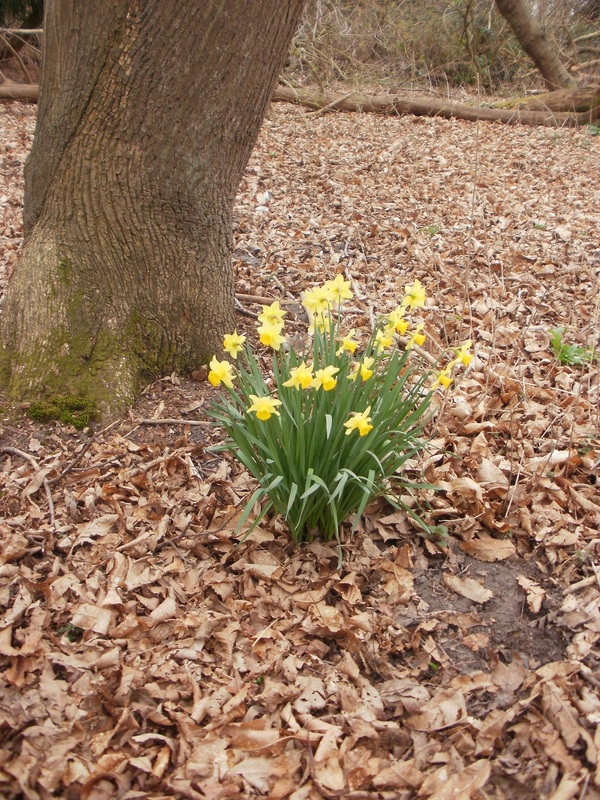 Occasional pockets of daffodils were under trees, and using one’s imagination one could visualise the bluebells and azaleas that would no doubt flower in a few week’s time. The first cache, when we did arrive was worth the walk. Hidden high in a tall broken stump/tree and well hidden under barkoflage. As the cache was quite large we dropped off the trackable “Just Ducky” to continue its adventures. 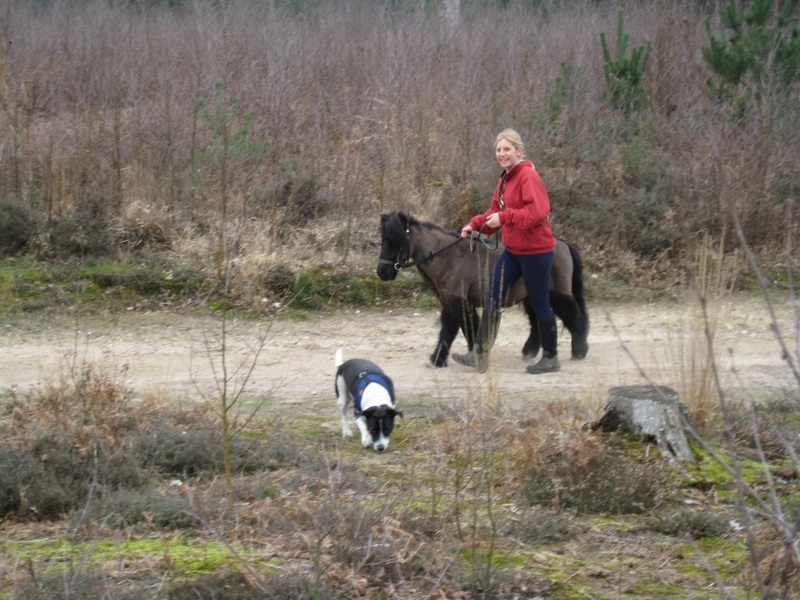 We were just leaving the cache when a walker with her Shetland pony (and dog) came by. A lovely and unexpected sight! 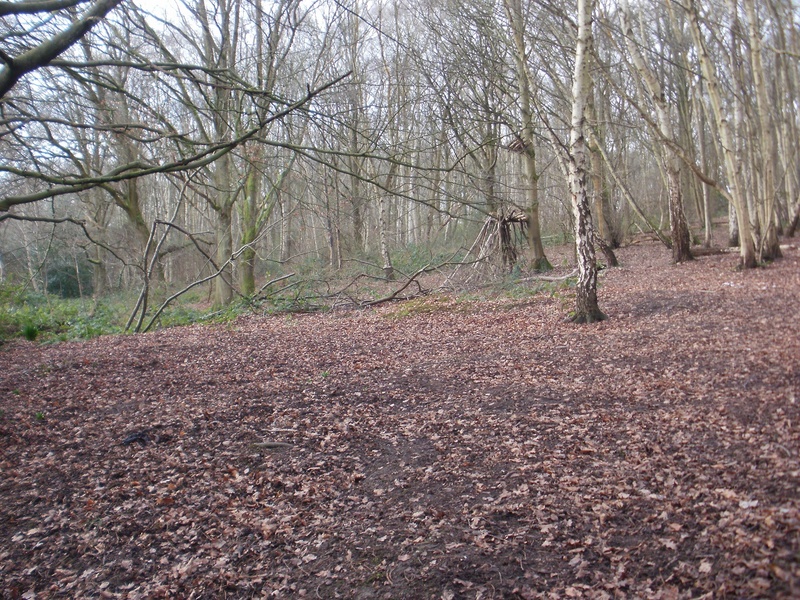 Most of the Ockham Common series were typical woodland hides: sometimes under fallen branches, sometimes in trees, sometimes under the ubiquitous pile of twigs or stones. 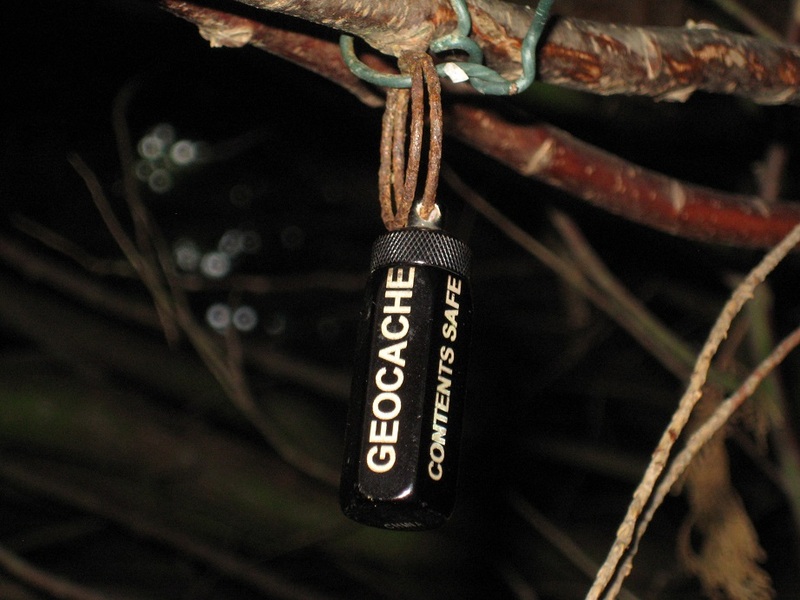 In fact a very simple but effective series of caches. 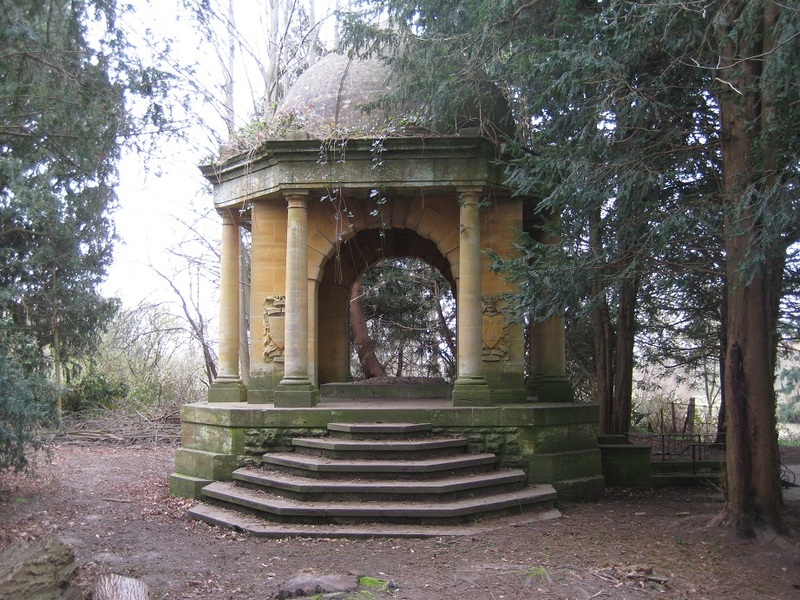 We had just got into the relaxed easy nature of the caches when suddenly he came upon… a mausoleum! 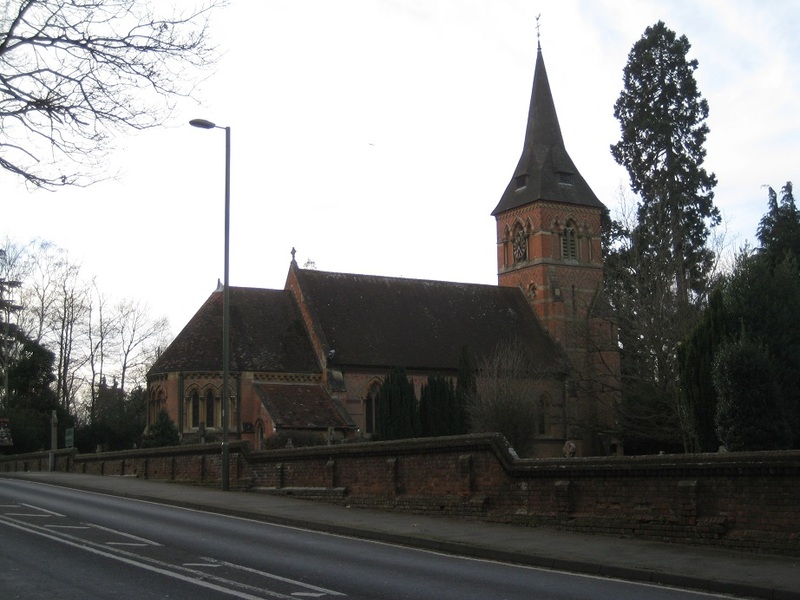 The mausoleum was built early in the 20th century for the re-interment of Sir Bernhard Samuelson(1820-1905), his wife Caroline (1821-1886) and their daughter Florence (1857-1881). It was designed and built by Sir Bernhard and Caroline’s son, Henry, so that they could all be buried together when he passed away. However he (Henry) was interred elsewhere and the chest-tomb has subsequently been stolen. An impressive structure and not one we would have found with geocaching to lead us there! We paused for reflection (sorry, coffee) here and then continued on. The mausoleum was at the furthest point away from the busy A3/M25 so it was quiet(ish). The noise levels rose as we approached our final few caches. 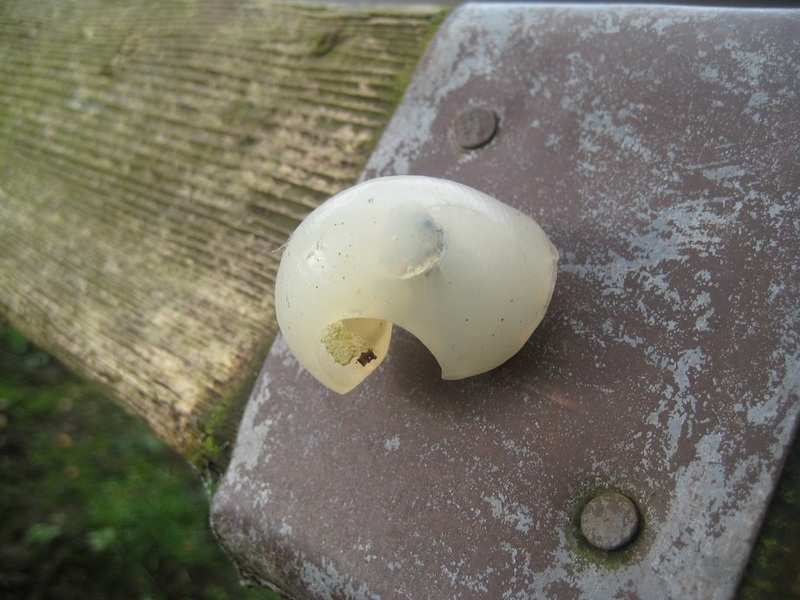 One of these was hidden in a Chestnut tree (though as many of the trees were still winter-dormant, it was tricky to verify whether it was a chestnut or not. 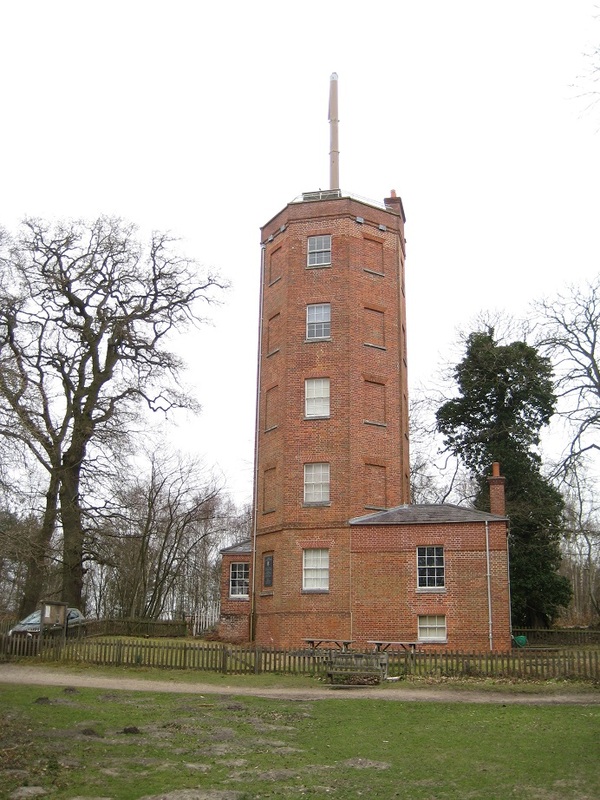 The tree did stand next to another impressive structure, a Semaphore Tower. The tower was built just after the Napoleonic Wars as part of a chain of towers linking London to the naval city of Portsmouth. Messages could be relayed much quicker than horseback using semaphore between the towers, and was the forerunner of the electric telegraph system of communication. and is open certain Sundays during the Summer. Our final three caches were easy straightforward which left is with the tricky decision whether to attempt the final part of the multi-part cache…or head for Wisley. 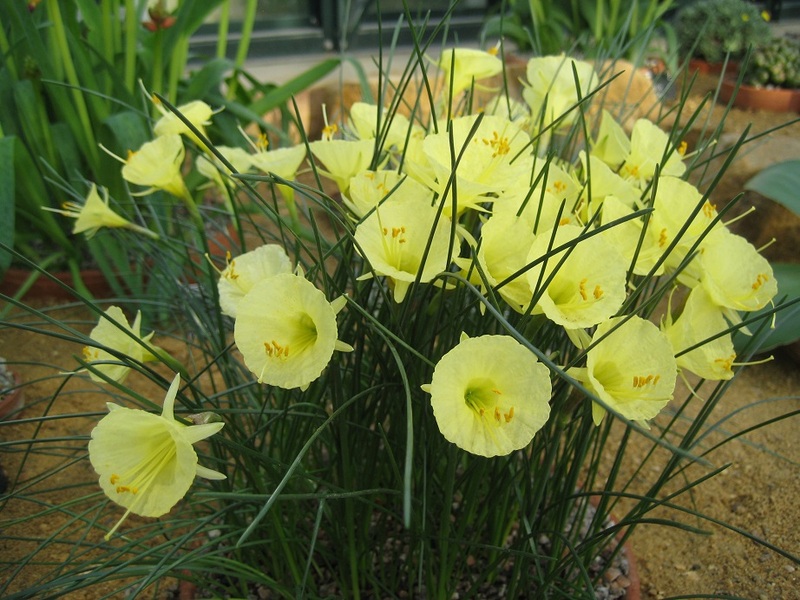 With shower clouds threatening, Wisley won and the multi-cache will again wait for yet another day! The 1000 cache milestone is approaching. 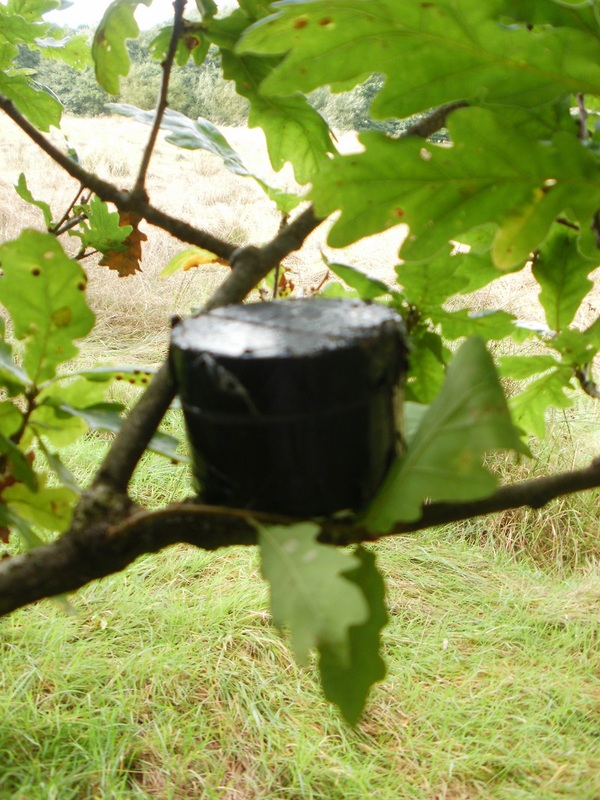 A special caching day is planned, during which we will reach the magic 4-figure cache number, and we have thought of a suitable location, with lots of interesting and challenging caches. 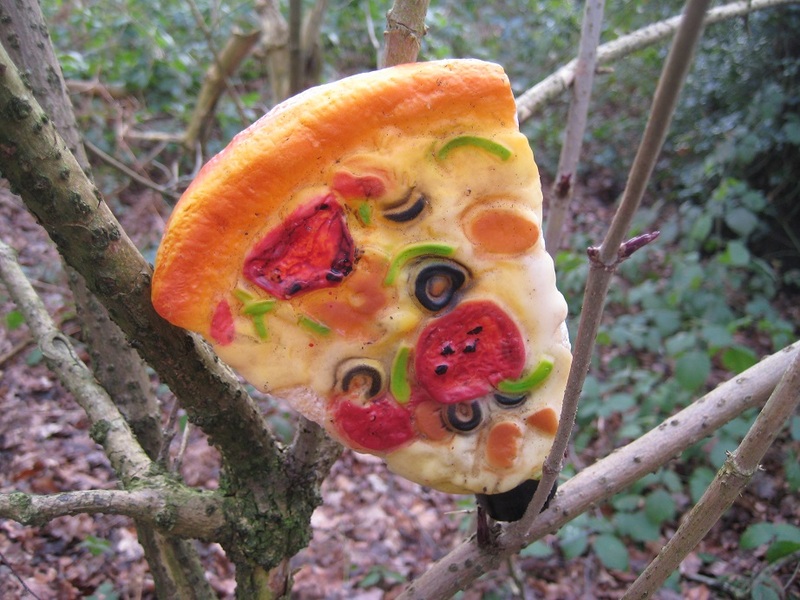 But first we need a few more caches to get closer to the magic number. So where to geocache? 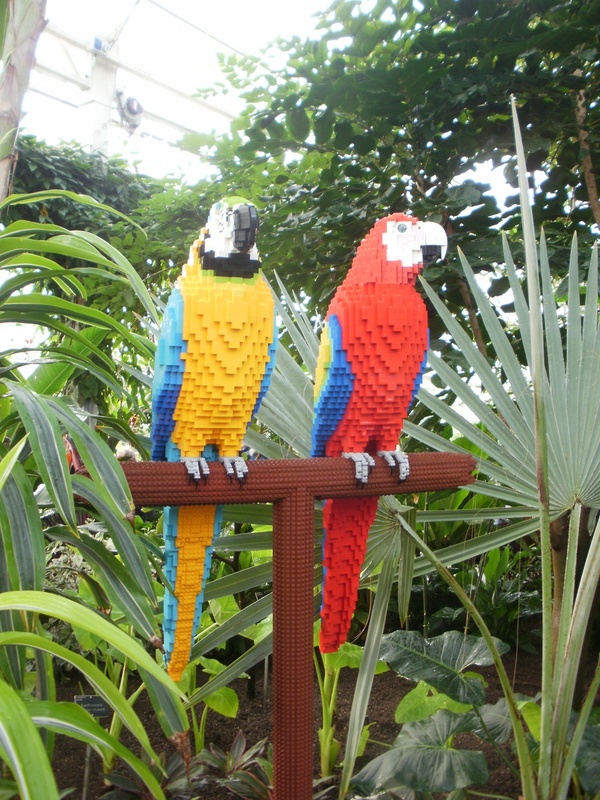 We decided to complete the More Common series, which we started last summer, and then finish off with a visit to Wisley RHS garden. 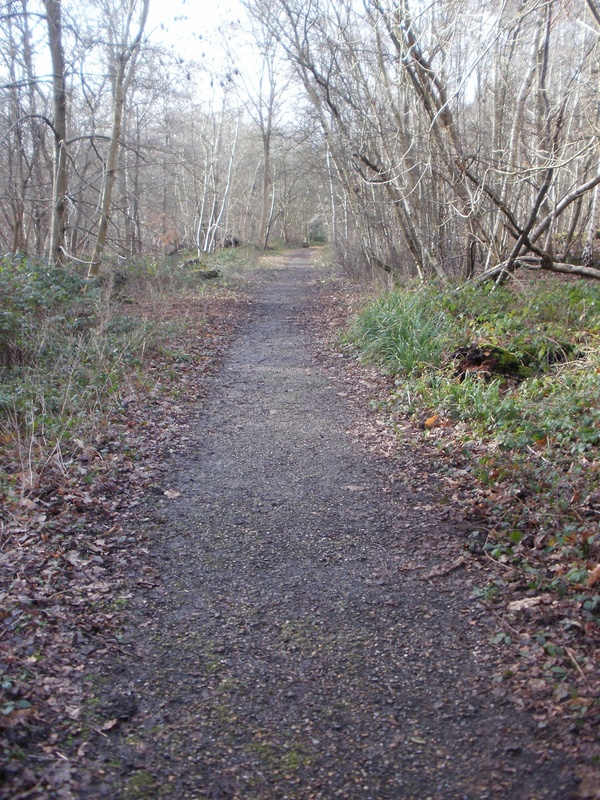 Our route started off along a footpath which runs through Wisley gardens and along the River Wey. 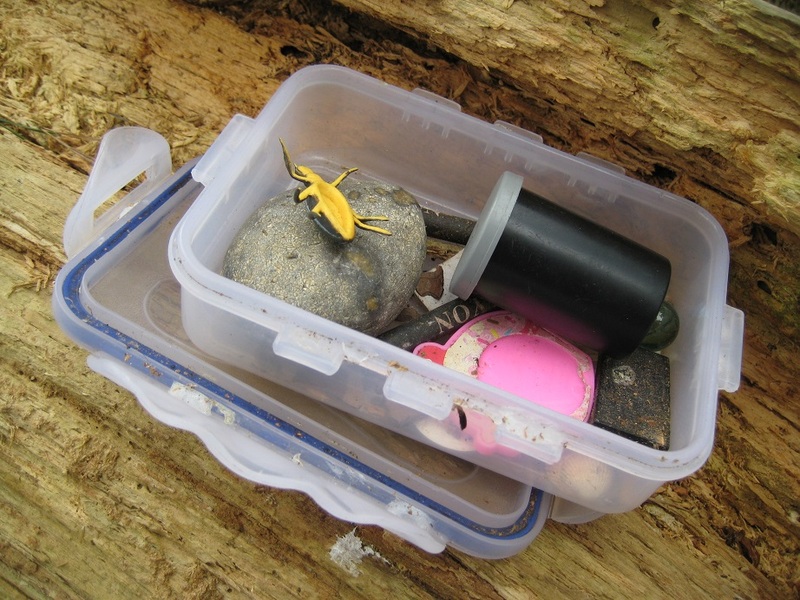 The caches came regularly, were easily found and were in great condition. 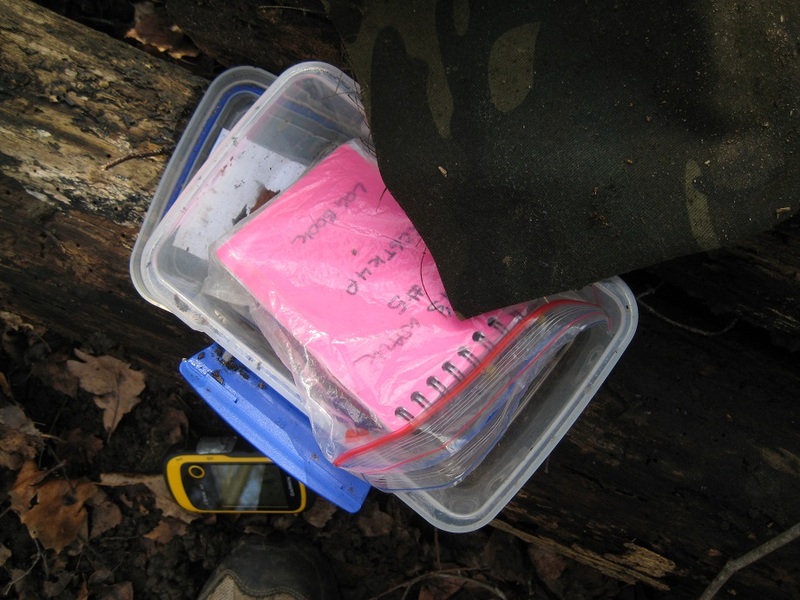 Well done to the cache owner, C-kit, for the well camouflaged containers and the neat idea of storing the log in a 35mm film canister inside the main container – keeps everything nice and dry! 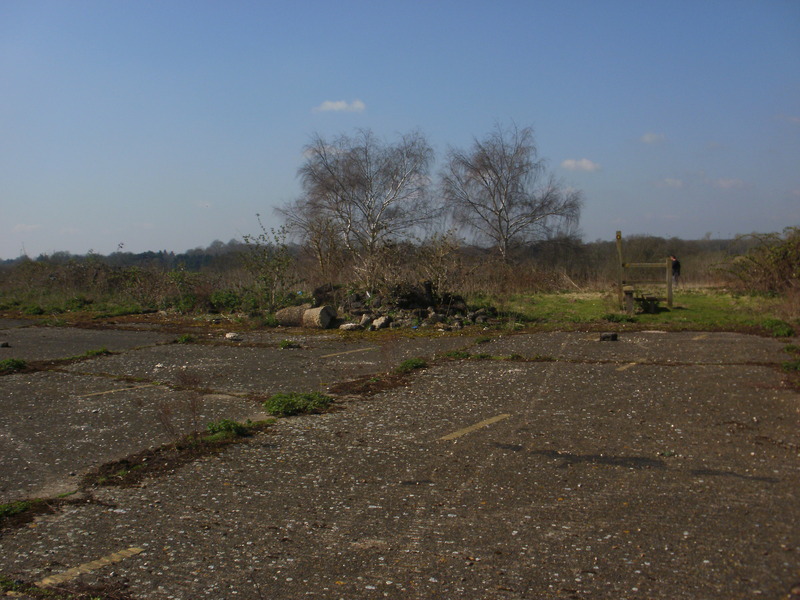 Then it was under the A3 and onto the disused Wisley airfield (did you know that existed? Did you know that it was a location for the film ‘War Horse’?). While here, we came across a man, GPS in hand, hunting around where we thought the cache would be. Another cacher, we thought, but our neutral question of ‘Are you looking for something?’ didn’t bring the answer we were expecting; he was a wildlife ranger, out looking for reptiles; he had spotted a grass snake but he said that all four of the common British reptiles can be found on the site. We finished by leaving the airfield and crossing the A3 on a footbridge, and heading towards the gardens. Cache here? Or snake here? We made two diversions from the route. One was successful, one wasn’t. The unsuccessful detour was to ‘Ripley Erection’ (hmm), a difficulty 4 i.e. hard cache near the edge of the common. We couldn’t even spot the cache, let alone climb 15 feet up a pole to get it – we gave up. More successful was our foray into the middle of a very busy roundabout under the A3 to collect ‘Roundabout Ramble 1’, which we managed without being squashed. We found all 13 of the caches we attempted. 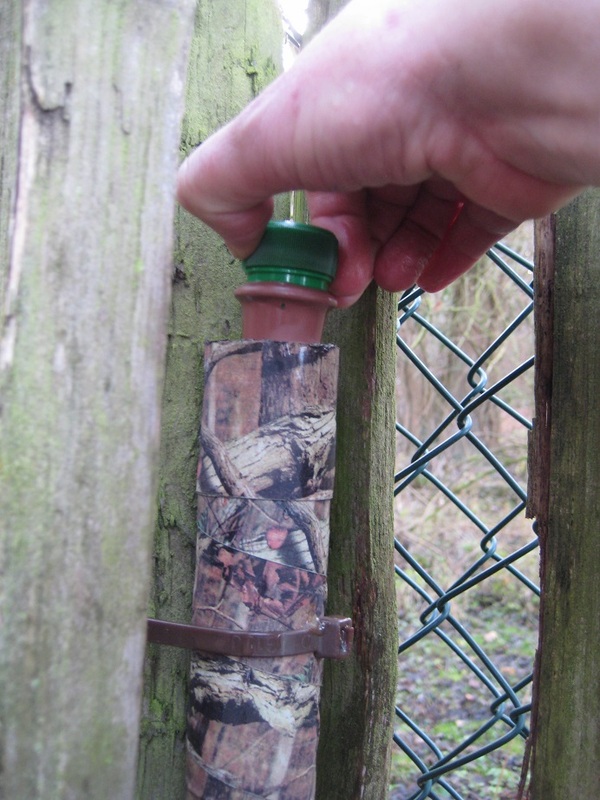 That takes our total caches found to 982, just a little closer to that milestone of 1000. 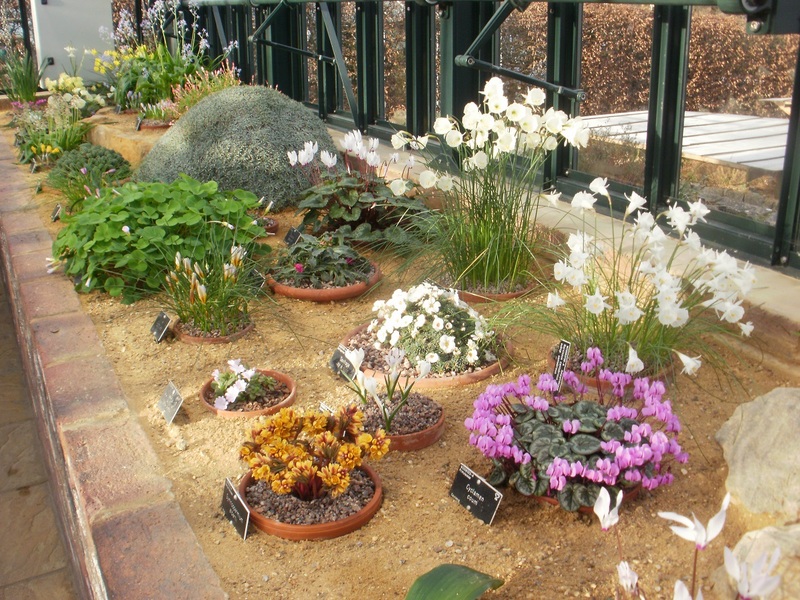 Finally, how were the gardens at Wisley? Crowded, as you’d expect on a sunny Bank Holiday, and resplendent in the spring sunshine. 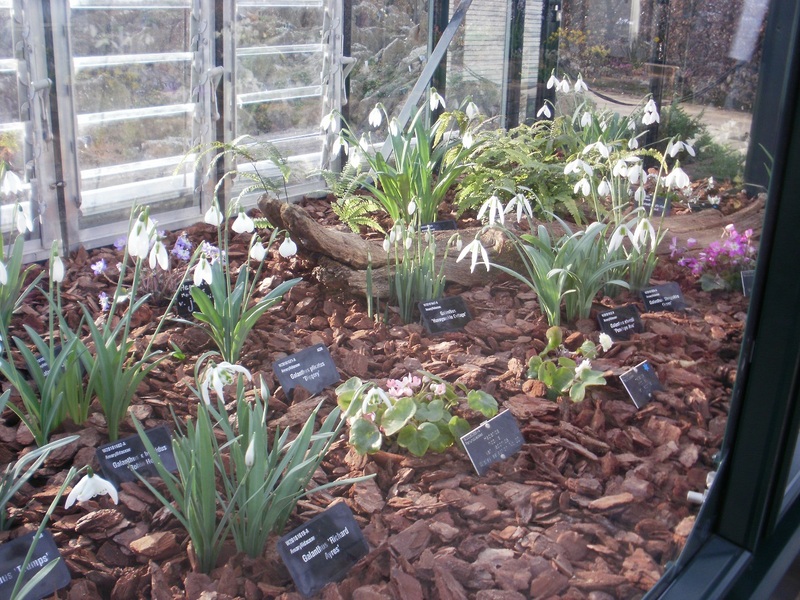 And, what’s more, we spotted the Easter Bunny, who was hiding near the glasshouse!